81. Sadler to Suffolk, Parr and Tunstall. The letter of this date in Sadler State Papers, I. 275, is of the 27th. See No. 85. Add. MS. 28,593, f. 235. B.M. 82. Prince Philip to Chapuys. Was glad to get his letters of 17 July and especially for certain news (described) therein, but notes that there was no account of Chantone's mission. Chapuys will have already heard how, on St. James's Day, (fn. 1) Don Alvaro de Baan defeated a French fleet which threatened Galicia, capturing 16 ships and many hackbuttiers and other soldiers from Bayonne and elsewhere. Describe Barbarossa's arrival in France and the subsequent descent upon Nice. Valladolid, 26 Aug. 1543. Spanish. Modern transcript from Simancas, pp. 6. See Spanish Calendar, VI. II., No. 208. Harl. MS. 169, f. 209 B.M. 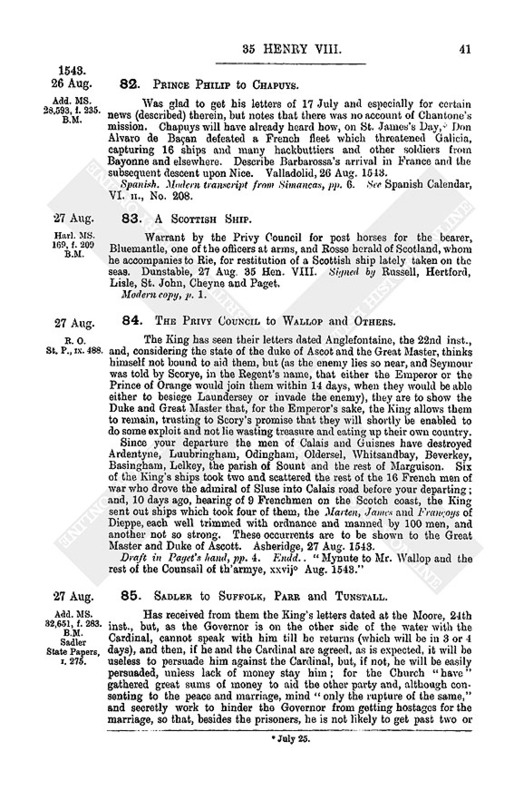 Warrant by the Privy Council for post horses for the bearer, Bluemantle, one of the officers at arms, and Rosse herald of Scotland, whom he accompanies to Rie, for restitution of a Scottish ship lately taken on the seas. Dunstable, 27 Aug. 35 Hen. VIII. Signed by Russell, Hertford, Lisle, St. John, Cheyne and Paget. R. O. St. P., IX. 488. 84. The Privy Council to Wallop and Others. The King has seen their letters dated Anglefontaine, the 22nd inst., and, considering the state of the duke of Ascot and the Great Master, thinks himself not bound to aid them, but (as the enemy lies so near, and Seymour was told by Scorye, in the Regent's name, that either the Emperor or the Prince of Orange would join them within 14 days, when they would be able either to besiege Laundersey or invade the enemy), they are to show the Duke and Great Master that, for the Emperor's sake, the King allows them to remain, trusting to Scory's promise that they will shortly be enabled to do some exploit and not lie wasting treasure and eating up their own country. Since your departure the men of Calais and Guisnes have destroyed Ardentyne, Luubringham, Odingham, Oldersel, Whitsandbay, Beverkey, Basingham, Lelkey, the parish of Sount and the rest of Marguison. Six of the King's ships took two and scattered the rest of the 16 French men of war who drove the admiral of Sluse into Calais road before your departing; and, 10 days ago, hearing of 9 Frenchmen on the Scotch coast, the King sent out ships which took four of them, the Marten, James and Franoys of Dieppe, each well trimmed with ordnance and manned by 100 men, and another not so strong. These occurrents are to be shown to the Great Master and Duke of Ascott. Asheridge, 27 Aug. 1543. Draft in Paget's hand, pp. 4. Endd., "Mynute to Mr. Wallop and the rest of the Counsail of th'armye, xxvijo Aug. 1543." Add. MS. 32,651, f. 283. B.M. Sadler State Papers, I. 275. 85. Sadler to Suffolk, Parr and Tunstall. 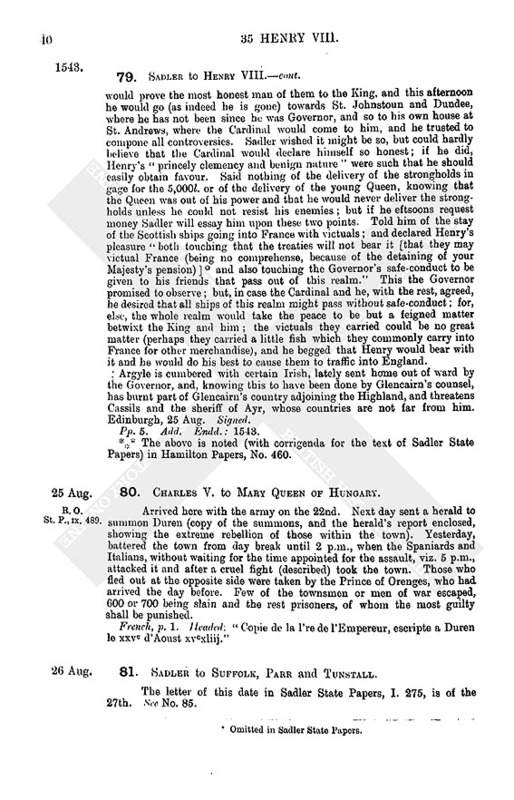 Has received from them the King's letters dated at the Moore, 24th inst., but, as the Governor is on the other side of the water with the Cardinal, cannot speak with him till he returns (which will be in 3 or 4 days), and then, if he and the Cardinal are agreed, as is expected, it will be useless to persuade him against the Cardinal, but, if not, he will be easily persuaded, unless lack of money stay him; for the Church "have" gathered great sums of money to aid the other party and, although consenting to the peace and marriage, mind "only the rupture of the same," and secretly work to hinder the Governor from getting hostages for the marriage, so that, besides the prisoners, he is not likely to get past two or three. The Governor's delay in sending the commissioners is to get more hostages, and he much trusts to a respite of 15 days; but Cassils, who tarries behind, told Sadler yesterday that, rather than adventure the breach of the treaties, the Governor would enter such hostages as he could get before Friday night next. Before leaving, the Governor prayed Sadler to advertise him as soon as the King's answer arrived touching the respite; which, as they know, he will now pass over in silence. The laird of Fyvie will make haste, so that the treaties may be ratified within the time limited. He is a man of 1800 mks. Scottish (almost 500 mks. st.), "a great living in this country," and well affected to the King. Has received theirs of the 26th (fn. 2) inst. and perceives that they have already advertised the King of the Swepestake, so that he need not enquire thereof. The French ship chased into Dundee is a small vessel. Another called the Falcon, a fair ship, was chased into Montrose on this side of Aberdeen. None of the King's ships followed them. Cannot hear of the Sacker and the rest, and is glad their lordships can make so good account of six of them. There were not past 3 or 4 more of that conserve. Other Scottish ships affirm that the King of Denmark has set forth such a navy as Sadler wrote of. As soon as the Governor returns Sadler will move him for the safe-conduct for grain, which Suffolk writes of. Edinburgh, 27 Aug. Signed. Pp. 3. Add. Endd. : 1543. *** The above is noted (with corrigenda for Sadler State Papers) in Hamilton Papers, No. 466. 86. Wotton to Henry VIII. The Regent having made great shift to borrow money without interest, which is hard to get, departed towards Mechelyn on Saturday and goes this day to Lovain, where Wotton will overtake her to-morrow. Last time he spoke with her she minded to go no further, for at Maestricht and Dieste "they die a little of the plague"; but now he hears that she will go to Luyke, and be nearer the Emperor "which is all her desire." The Prince of Orenge has taken a little town and castle called Montjoye and slain all that defended it. It lies, in the highest part of Gulik towards the forest of Ardenne and Luxemburgh, commodiously for the Clevois to do the Emperor hurt. This day came tidings to the merchants that the Emperor took Duren on Friday last, after 4 or 5 assaults, and slew all the men in it because they yielded not at the first warning, although afterwards they offered so to do. Others say that it was won at the first assault by the Spaniards and Italians; and yet there were 5 ensigns of footmen and 300 horsemen within. The Emperor spared no gunpowder and spent above 500 shot upon it. The merchants learn that Barbarossa besieges Nice, wherein is the Duke (fn. 3) himself. Andwerpe, 27 Aug. 1543. Add. MS. 32,651, f. 285. B.M. Hamilton Papers, No. 467. 87. The Privy Council to Sir Wm. Eure. The King has received his letters; and reserves to his own use all such "checkes" as Sir John Withrington and Sir Robt. Ellerker have incurred by absence from their offices at Berwick. Eure shall send for them to reside upon their offices, or else the King will plant others in their place. Dunstable, 28 Aug. Draft in Paget's hand, p. 1. Endd. : Mynute to Sir William Evre, xxviijo Augusti, 1543. Sends a letter which this Council have written him, showing what little news there is since his last, and also the difficulty of satisfying and living with the English, and that he was not wrong in what he last wrote to the Emperor of their suspicious nature. Has [sent] a man to satisfy them and will advertise Granvelle of his report. This King has lately complained, among those of his Chamber, more bitterly (aigrement) with regard to the subject of the said letter, and especially that all things which the said letter sings are not confided to him. It seems that the Scots have not yet sent the hostages promised by the treaty, and that things are not altogether so peaceable and sure there as was presumed. London, 28 Aug. 1543. French, p. 1. Modern transcript from Vienna. 89. Chapuys to the Queen Of Hungary. Sends the copy of a letter which this Council have written him, showing etc. (As in the preceding to Granvelle almost verbatim.) Begs her to recommend the affair of his salary if she has not already done so. London, 28 Aug. 1543. Newcastle upon Tyne, 28 Aug. 35 Hen. VIII. :Brief declaration by John Uvedale, treasurer appointed for payment of Charles duke of Suffolk, lieutenant in the North, my lord Warden, the earl of Angwishe, George Douglas and the garrisons on the Borders, numbering 460 men; of which a signed copy is delivered to my lord Lieutenant. Showing that at his declaration on the 11th inst. he had (whereof in broken and refuse gold 107l. 8s. 8d., and in bills of prest to the earl of Rutland and Sir Robt. Bowes 100l. and 66l. 13s. 4d. respectively) 2,367l. 12s. 2d. ; and received on 26 Aug. of Leonard Bekwith, 465l. Whereof he has, by Suffolk's command, sent to Sir Ralph Sadler in Scotland 300l., to Sir Wm. 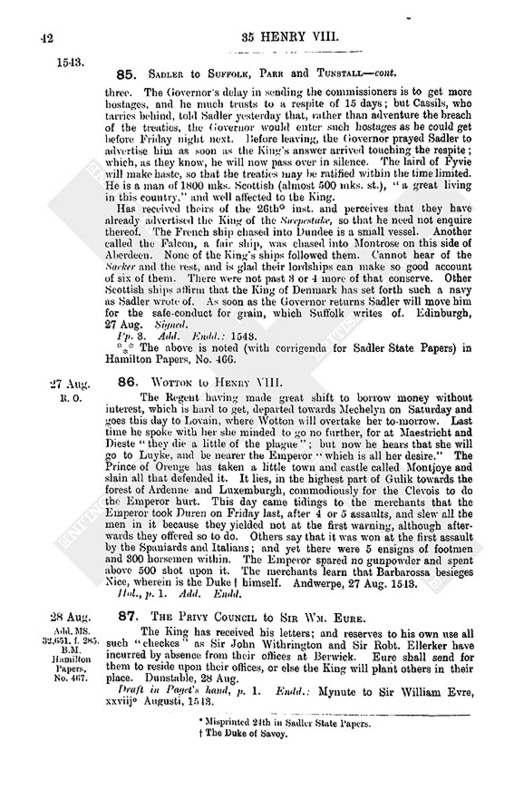 Eure to convey into Scotland 275l., to Suffolk for his diets and the wages of his 100 men to 28 Aug. 233l. 6s. 8d., to Angwishe for one month beginning this day 105l. 9s. 4d., and to George Douglas for the like 101l. 14s. 8d. Also he has paid lord Parre, lord Warden of the Marches, for diets and for wages of 100 men for a month beginning this day, 176l. 8s. Remainder, 1,640l. 13s. 6d. Whereof he must pay, out of hand, to Suffolk for himself and his 100 men for one month beginning 29 Aug. 233l. 6s. 8d., and to the garrisons of 460 men fourteen days' wages, viz., 238l. 16s. 4d. Which will leave but 1,168l. 10s. 6d. 91. Sadler to Henry VIII. The letter of this date in Sadler State Papers, I. 277, is of the 29th. See No. 94. 92. Wallop to the Council. Since coming to the Burgonyons, we have lain still in camp, fearing the French king's power. Lately heard that the French king was departed from Cowcye castle towards Raynes in Champaigne; and thereupon urged the duke of Arschot and Great Master to do some enterprise, abiding the Emperor's answer. They said they would gladly; and, hearing that night that 200 light horse, Italians and Albanoys, lay at Fontsome, 6 leagues off, and most of the French king's power was departed, the Duke, Great Master and Wallop concluded to go with 6,000 foot and 2,000 horse, leaving the camp in charge of Mr. Seymour, our marshal. Mons. de Lyekes was appointed to give the onsetting to the said light horse, and the rest to enter the country between Chasteau in Cambresis and the duke of Vandome's castle of Bougheyn, where were many great villages and strong churches. Started at 5 p.m. on Saturday 26 Aug., Mons. de Lyekes having with him Bowmer and 50 of the Northern horse, and two of Wallop's horsemen who could speak French. By 4 o'clock next morning, the Great Master and Wallop were in the appointed country and, after long waiting for the Duke's coming, began to fire the villages, and had churches yielded to them, when Lyekes retired towards them in great fear, having had a great overthrow. Describes the battle, in which the Italians and Albanoys were surprised in bed and beaten out of the village, but rallied and, aided by others who lay in an abbey adjoining, returned and completely discomfited the Burgundians. De Lyekes had 600 Burgundian horse and 800 foot besides the 50 Northern men, and has lost 100 horsemen and almost all the foot. The enemy could not have numbered more than 150, for 50 of their horses were carried off at the outset. Upon news of this the Duke and Great Master gave up the idea of going to Bougheyn and returned to Camp. Yesterday, the 25th (sic) inst., was an alarm between the Allemen and the Englishmen; and the latter were almost into the Allemen's camp, bestowing arrows upon them (and they bestowing shot amongst us), when, by the help of Mr. Crumwell, Mr. Carow, and other gentlemen, we caused them to retire. "And at my retire (fn. 4) to the body of the Camp I found the Allemen in a fair square battle, and ours in like case"; and, but for the travail of the Duke and Great Master there had been a battle. They stood thus more than an hour, each party making strange which should retire first, while the Great Master and others "hurled hither and thither, persuading first the one part and then the other to retire," saying the stronger might with honor retire first "which they thought to be us." Finally both retired at a signal given, by the Great Master holding up his hat. I declared to the Duke and Great Master, who supped with me, the folly of the Allemen colonel who, after the skirmish was pacified, entered our camp with a dozen of his "harcbuzyers" and seeing me with my sword drawn "offered to shoot at me with his harcbouze. Mr. Crumwell, perceiving the same leapt unto him and put by the shot; which his (sic) great folly, if good order had not been, had been despatched, for Master Carow was minded to run him through with his sword; and young Seyntlow, perceiving him to level at me, did the same towards him, and, as God would, his gun failed to take fire or else he had surely slain him, whereat I do not a little rejoice, for if this thing had taken effect we should not have been able this year to invade the realm of France, so many should should (sic) have suffered on both sides." This morning the Duke rebuked the Colonel and other Allemen captains, commanding them to keep better order and apologise to Wallop, "which thing they did very humbly and penitently," The Spaniards are always ready to do Englishmen pleasure, and take their part in all frays with other nations. This day Wallop persuaded the Duke and Great Master not to lie in camp, but rather to waste the French king's lands, seeing now that the Allemen repair to the French king. They promised on Friday next to beginthe Great Master meaning earnestly, "whatsoever the Duke doth mean." Sends extracts from letters to the Duke and Great Master about the Emperor's being before Durre, and from a letter of the King of Romans about the Turk's being before Strygoigne. Quesno, 28 Aug. Signed. Pp. 6. Add. Endd. : 1543. Add. MS. 32,651, f. 286. B.M. Hamilton Papers, No. 468. 93. The Privy Council to Suffolk, [Parr and Tunstall]. Have received their letter of the 28th inst. with the certificate of able men within Suffolk's lieutenancy ("and the view of the account of Mr. Vuedal" in No. 99). The King thanks them for their forwardness and, perceiving that the quantity of grain there ("in th'ands of Mr. Shelley" in No. 99) is so great that they have no room to bestow the grain brought lately by the 16 sail, commands them to stay that grain in the owner's hand and issue as much of the old provision ("of the worst of th'old store" in No. 99) into Scotland or Flanders or elsewhere as will leave room for it, which in any case shall be stayed to the King's use, that he may have enough for an army of 16,000 or 20,000 men. Which number they shall put ready upon any sudden warning, as sufficient to receive the holds on this side the Frith, "if the Governor shall fortune to offer them" or work any other exploit; the King not doubting but that Suffolk "hath good heart and courage" to adventure his person with it. The Armestronges in prison at Carlisle are to be set free, if their friends in Scotland will deliver Forster, and the other three, and the Armestronges of Liddisdale will become the King's servants. Touching Exham and Langley they have misunderstood the Council's letter concerning the holds in Tynedale. Draft in Paget's hand, pp. 4. Endd. : Mynute to the duke of Suff., etc., xxixo Augusti 1543. Add. MS. 32,651, f. 289. B.M. Sadler State Papers, I. 277. 94. Sadler to Henry VIII. Wrote that the Governor made an errand over the Frythe to speak with the Cardinal, who, he supposed, would "have humbled himself so much as to have met him on the way"; but, in proof that his fair behests are but practises, the Cardinal neither met him nor would speak with him when he came to St. Andrews, but desired that Sir George Douglas should come to him in the Castle. Sir John Campbel of Calder, Argyle's brother, was laid as pledge and Douglas went into the Castle, but could not persuade the Cardinal to wait upon the Governor. 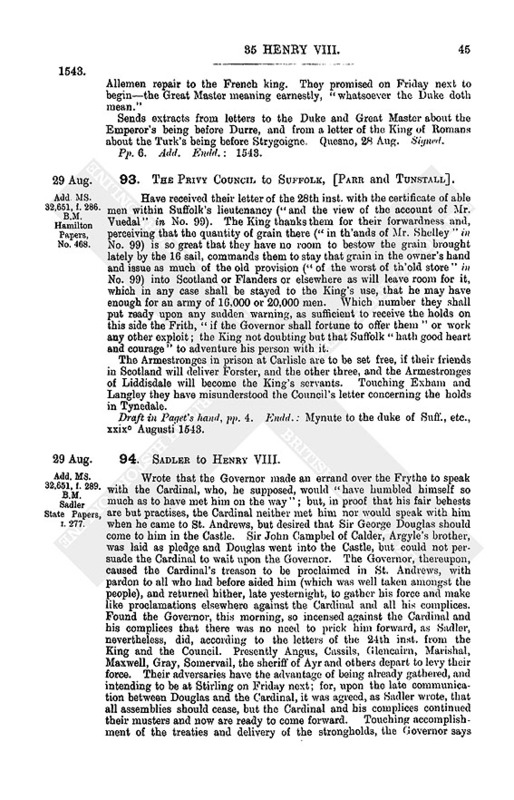 The Governor, thereupon, caused the Cardinal's treason to be proclaimed in St. Andrews, with pardon to all who had before aided him (which was well taken amongst the people), and returned hither, late yesternight, to gather his force and make like proclamations elsewhere against the Cardinal and all his complices. Found the Governor, this morning, so incensed against the Cardinal and his complices that there was no need to prick him forward, as Sadler, nevertheless, did, according to the letters of the 24th inst. from the King and the Council. Presently Angus, Cassils, Glencairn, Marishal, Maxwell, Gray, Somervail, the sheriff of Ayr and others depart to levy their force. Their adversaries have the advantage of being already gathered, and intending to be at Stirling on Friday next; for, upon the late communication between Douglas and the Cardinal, it was agreed, as Sadler wrote, that all assemblies should cease, but the Cardinal and his complices continued their musters and now are ready to come forward. Touching accomplishment of the treaties and delivery of the strongholds, the Governor says plainly that he cannot perform the treaties within the time limited, and that if he deliver the strongholds he must fly the realm, for his friends will forsake him. Sadler reminded him of his promises and advised him to write them, so that the King might see his good-will to the same. He answered that he must adhere to the King, for he had lost all other friends and was in great danger; wherefore he had determined to send the laird of Brunstoun to declare his state and make such offers as would show the King his good heart, trusting that the King would not suffer him to be overtrodden by those who would destroy all his friends here and bring the whole realm (already inclined thereto) to the cast of France. Advised him not to seek aid without making reciprocal offers, or the King (who had experimented the world's practises) would soon perceive it. He thanked Sadler for the advice, and promised, before despatching Brunstoun, to show Sadler his offers. Has communed with Angus, Cassils, Glencairn, Maxwell and Douglas, and finds them all "very hot upon their enemies"; but they think the King must support the Governor with money "or else send a main army to conquest the realm" (which they would join), for the sending of a small number or delivery of the holds would cause all their countrymen to forsake them. 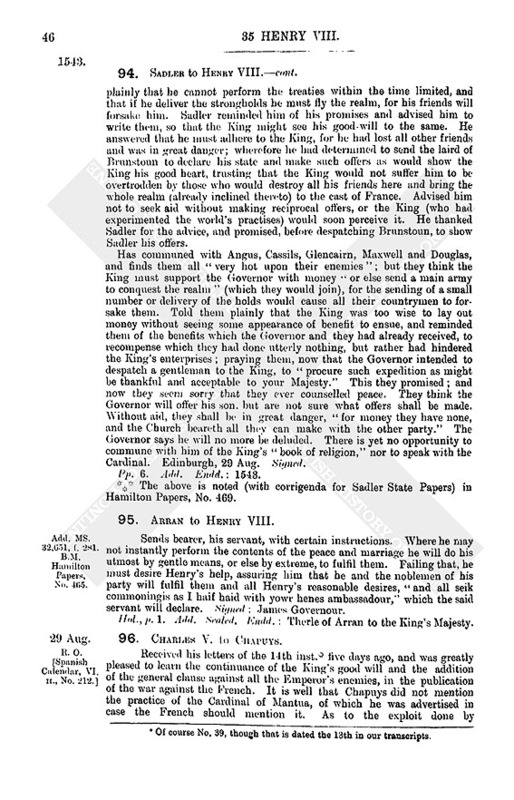 Told them plainly that the King was too wise to lay out money without seeing some appearance of benefit to ensue, and reminded them of the benefits which the Governor and they had already received, to recompense which they had done utterly nothing, but rather had hindered the King's enterprises; praying them, now that the Governor intended to despatch a gentleman to the King, to "procure such expedition as might be thankful and acceptable to your Majesty." This they promised; and now they seem sorry that they ever counselled peace. They think the Governor will offer his son, but are not sure what offers shall be made. Without aid, they shall be in great danger, "for money they have none, and the Church beareth all they can make with the other party." The Governor says he will no more be deluded. There is yet no opportunity to commune with him of the King's "book of religion," nor to speak with the Cardinal. Edinburgh, 29 Aug. Signed. *** The above is noted (with corrigenda for Sadler State Papers) in Hamilton Papers, No. 469. Add. MS. 32,651, f. 281. B.M. Hamilton Papers, No. 465. 95. Arran to Henry VIII. Sends bearer, his servant, with certain instructions. Where he may not instantly perform the contents of the peace and marriage he will do his utmost by gentle means, or else by extreme, to fulfil them. Failing that, he must desire Henry's help, assuring him that he and the noblemen of his party will fulfil them and all Henry's reasonable desires, "and all seik commoningis as I haif haid with yowr henes ambassadour," which the said servant will declare. Signed : James Governour. Hol., p. 1. Add. Sealed. Endd. : Therle of Arran to the King's Majesty. 96. Charles V. to Chapuys. Received his letters of the 14th inst. (fn. 5) five days ago, and was greatly pleased to learn the continuance of the King's good will and the addition of the general clause against all the Emperor's enemies, in the publication of the war against the French. It is well that Chapuys did not mention the practice of the Cardinal of Mantua, of which he was advertised in case the French should mention it. As to the exploit done by the English in France, it is true that they have used all rigor, without even sparing the Emperor's subjects who have goods in France, wherein they should have had better regard. It remains that the King may be willing that they may continue in the war against France, because he is thereto bound by the treaty, since the French have occupied and detain Landreschies with a greater force than the treaty mentions, and Arschot and De Roeulx are in arms to recover it. In this Chapuys must use his accustomed dexterity, in accordance with what the Queen has passed in it with the captain (fn. 6) of the English, and what has passed between Arschot and De Roeulx and the said captain. Where he wrote to Granvelle that the King would not have liked the enterprise against Cleves had it been spoken of when Chantonay was last in England, knows that it was for the best that he omitted it; but now that the Emperor is on the way it is requisite to inform the King that it is necessary to open the road between the Low Countries and Germany and to repress the insolence of the Duke and his people, who were boasting throughout Germany that the Emperor dared not pass that way and that they would join forces with France to destroy him; and to that end they had conspired the treason of Liege, which, with the necessity of victuals, has been no small reason for taking that road. Hopes to open it shortly and to advertise the King more expressly of what should be done further. Could not incline to peace with Cleves, as the electors on the Rhine and the duke of Saxony's men suggested, for the Duke insisted on retaining Guelders and Zutphen more insolently than before the Diet of Nuremberg, trusting to the support of France. 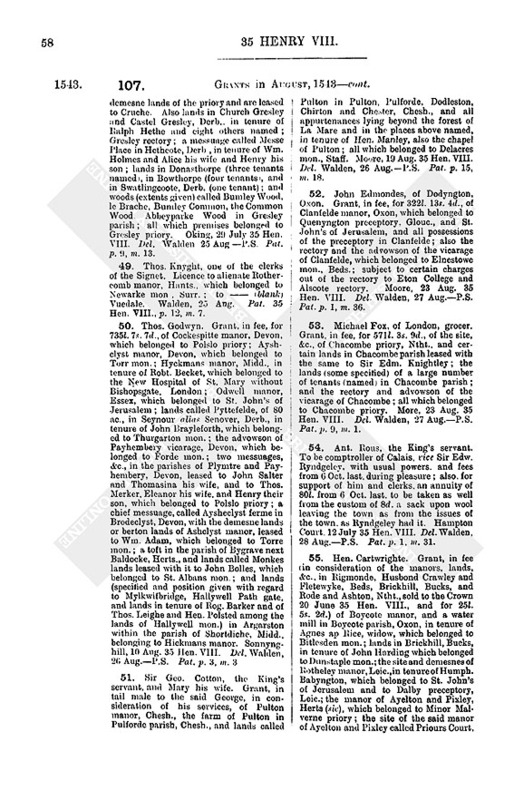 Has done his duty to the subjects of Cleves and Juliers, as the enclosed copy will show. As to the ships which should join those of England, the Queen will answer him, and will do therein what the weighty affairs there permit. 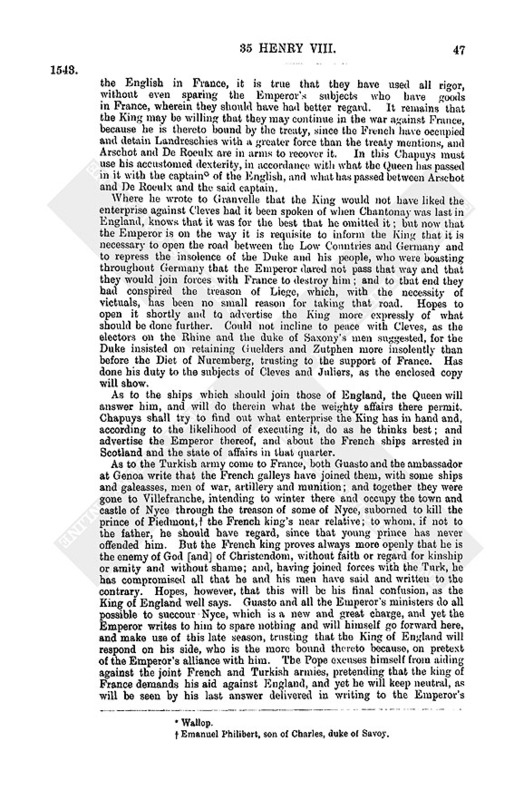 Chapuys shall try to find out what enterprise the King has in hand and, according to the likelihood of executing it, do as he thinks best; and advertise the Emperor thereof, and about the French ships arrested in Scotland and the state of affairs in that quarter. As to the Turkish army come to France, both Guasto and the ambassador at Genoa write that the French galleys have joined them, with some ships and galeasses, men of war, artillery and munition; and together they were gone to Villefranche, intending to winter there and occupy the town and castle of Nyce through the treason of some of Nyce, suborned to kill the prince of Piedmont, (fn. 7) the French king's near relative; to whom, if not to the father, he should have regard, since that young prince has never offended him. But the French king proves always more openly that he is the enemy of God [and] of Christendom, without faith or regard for kinship or amity and without shame; and, having joined forces with the Turk, he has compromised all that he and his men have said and written to the contrary. Hopes, however, that this will be his final confusion, as the King of England well says. Guasto and all the Emperor's ministers do all possible to succour Nyce, which is a new and great charge, and yet the Emperor writes to him to spare nothing and will himself go forward here, and make use of this late season, trusting that the King of England will respond on his side, who is the more bound thereto because, on pretext of the Emperor's alliance with him. 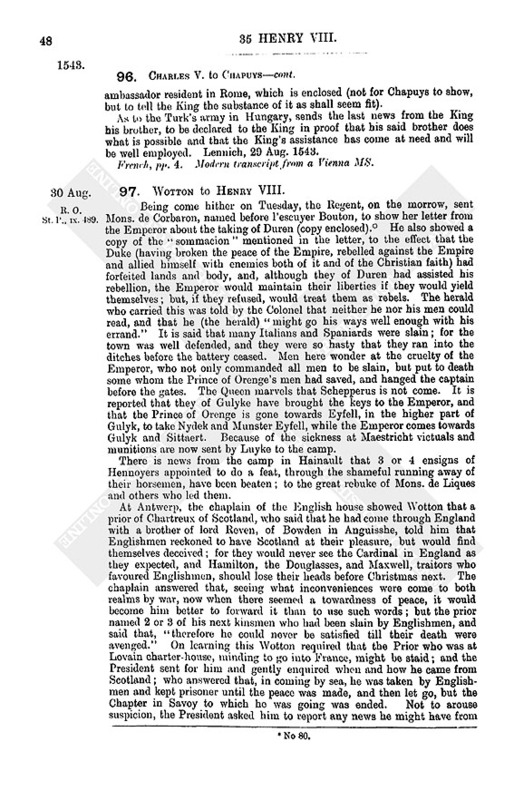 The Pope excuses himself from aiding against the joint French and Turkish armies, pretending that the king of France demands his aid against England, and yet he will keep neutral, as will be seen by his last answer delivered in writing to the Emperor's ambassador resident in Rome, which is enclosed (not for Chapuys to show, but to tell the King the substance of it as shall seem fit). As to the Turk's army in Hungary, sends the last news from the King his brother, to be declared to the King in proof that his said brother does what is possible and that the King's assistance has come at need and will be well employed. Lennich, 29 Aug. 1543. French, pp. 4. Modern transcript from a Vienna MS.
R. O. St. P., IX. 489. 97. Wotton to Henry VIII. Being come hither on Tuesday, the Regent, on the morrow, sent Mons. de Corbaron, named before l'escuyer Bouton, to show her letter from the Emperor about the taking of Duren (copy enclosed). (fn. 8) He also showed a copy of the "sommacion" mentioned in the letter, to the effect that the Duke (having broken the peace of the Empire, rebelled against the Empire and allied himself with enemies both of it and of the Christian faith) had forfeited lands and body, and, although they of Duren had assisted his rebellion, the Emperor would maintain their liberties if they would yield themselves; but, if they refused, would treat them as rebels. The herald who carried this was told by the Colonel that neither he nor his men could read, and that he (the herald) "might go his ways well enough with his errand." It is said that many Italians and Spaniards were slain; for the town was well defended, and they were so hasty that they ran into the ditches before the battery ceased. Men here wonder at the cruelty of the Emperor, who not only commanded all men to be slain, but put to death some whom the Prince of Orenge's men had saved, and hanged the captain before the gates. The Queen marvels that Schepperus is not come. It is reported that they of Gulyke have brought the keys to the Emperor, and that the Prince of Orenge is gone towards Eyfell, in the higher part of Gulyk, to take Nydek and Munster Eyfell, while the Emperor comes towards Gulyk and Sittaert. Because of the sickness at Maestricht victuals and munitions are now sent by Luyke to the camp. There is news from the camp in Hainault that 3 or 4 ensigns of Hennoyers appointed to do a feat, through the shameful running away of their horsemen, have been beaten; to the great rebuke of Mons. de Liques and others who led them. At Antwerp, the chaplain of the English house showed Wotton that a prior of Chartreux of Scotland, who said that he had come through England with a brother of lord Reven, of Bowden in Anguisshe, told him that Englishmen reckoned to have Scotland at their pleasure, but would find themselves deceived; for they would never see the Cardinal in England as they expected, and Hamilton, the Douglasses, and Maxwell, traitors who favoured Englishmen, should lose their heads before Christmas next. The chaplain answered that, seeing what inconveniences were come to both realms by war, now when there seemed a towardness of peace, it would become him better to forward it than to use such words; but the prior named 2 or 3 of his next kinsmen who had been slain by Englishmen, and said that, "therefore he could never be satisfied till their death were avenged." On learning this Wotton required that the Prior who was at Lovain charter-house, minding to go into France, might be staid; and the President sent for him and gently enquired when and how he came from Scotland; who answered that, in coming by sea, he was taken by Englishmen and kept prisoner until the peace was made, and then let go, but the Chapter in Savoy to which he was going was ended. Not to arouse suspicion, the President asked him to report any news he might have from Scotland; and not to depart without speaking first with the Queen or him. The President has commanded them of the Chartreux house here to give notice if they see any token of the said Prior's departure. The gentleman he came with is here too, but has not used any such words as the Prior did. Lovain, 30 Aug. 1543. 98. Tintern Abbey, in Ireland. Copy of an inquisition taken at Rosse, 30 Aug., 35 Hen. VIII., of the lands of Tintern Abbey in co. Wexford. Pp. 3. Endd. : A true copy taken out of the office of Tinterne in Ireland, belonging to Anthony Colclough, gent. 99. The Privy Council to Suffolk, Parr and Tunstall. Copy of their letter of the 29th, with some alterations in Wriothesley's hand. (See No. 93, where the chief alterations are noted.) Ampthill, 31 Aug. 1543. P.S.The King is content that Suffolk shall advance to Angus the 100l. for which Mr. Sadleyr wrote; advancing it as of his "own head," and using means, by letter, to stay his again asking money beforehand. Draft corrected by Wriothesley, pp. 3. Endd. : Mynute to my 1. of Suff., Par, etc., ultimo Augusti, 1543. Add. MS. 32,651, f. 295. B.M. Hamilton Papers, No. 471. 100. The Privy Council to Sadler. The King has seen his of the 26th to Suffolk and others of the Council in the North; and, considering how dangerously Stirling stands for the custody of the Queen, both because so near the Cardinal, Lynoux and the French party and because some of her keepers are of that faction, wishes that the Governor, in his return from beyond the water (or if he be already returned, at some other opportunity) should get possession of the castle, and either remove her to some nearer place or else remove the lords of the adverse party from her and put in friends. Draft in Wriothesley's hand, pp. 3. Endd. : Mynute to Master Sadleyr, ultimo Augusti, 1543. 101. Chapuys to the Queen Of Hungary. His man has just returned from Court, who was sent to answer the Council's letters, of which she would receive the copy with his last. By his man's report, the Council recognise that they have inconsiderately written it; and they pray Chapuys to take it in good part, as evidence of their affection to the conservation and augmentation of the amity between the Emperor and their master, which requires frequent and confidential communication of all things, and that the principal object of the letter was to get Chapuys' help in it and the assembly of the Flemish ships with theirs, for some good enterprise. Although the King has already written to her for 300 hacquebutiers and the assistance of the captains of St. Omer, Bourbourg and other neighbours, to prevent (with his men of war there and 1,000 whom he sends over with speed) the revictualling of Ardres, which the governor of Boulogne would effect with 6,000 men and 300 horse, he has again sent to Chapuys, very expressly, to write to her to gratify him in this, as far as possible, and in keeping him informed of occurrents, in return for the good will he shows to the Emperor's concerns. Lately, Sir John Gressam and Chapuys, hearing, by letters from the merchants to whom the letters of exchange for the 3,000l. were addressed, that the Queen would scarcely take the money in Antwerp, because of the great interest current there, the King (being advertised that the interest would be no less by delivering the money here for exchange, besides delaying the payment) licensed Gressam to send the 3,000l. thither in ready money. They wait only to know whether she will use the letters of exchange or not, and Chapuys is astonished that that advice is not yet come. London, 31 Aug. 1543. French, pp. 2. Modern transcript from Vienna. Takes the opportunity of this messenger to send copy of what he writes to the Queen, showing events since his last of the 27th. It remains only to pray Granvelle to get the Emperor to impart his news to this King, who having been heretofore "curieusement adverty et entretenu" by France, finds it strange that the Emperor does not do the same. "Il est prince qui veult estre any pen regallado, comme dit l'Espagnol, et par tel moien l'on s'en aydera comme l'on vouldra." London, 31 Aug. 1543. R.O. St. P., V. 332. Has sent his letter written yesternight late, with other two letters of Mr. Sadleyr's, to the Court with speed. 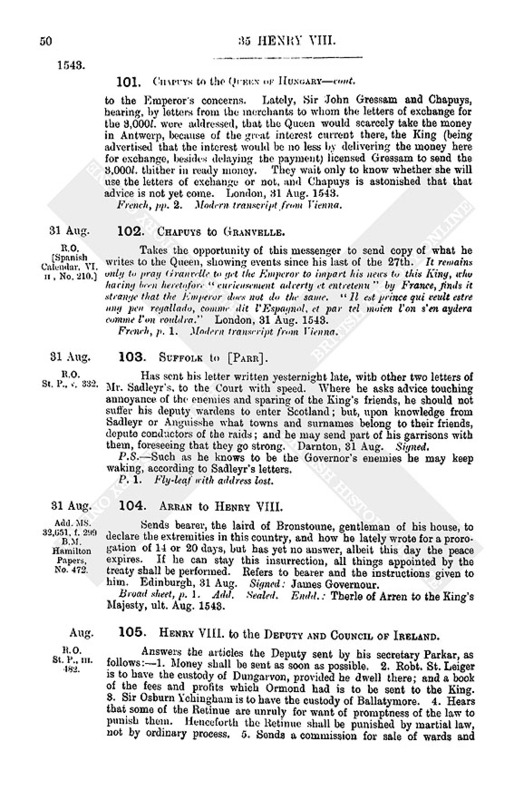 Where he asks advice touching annoyance of the enemies and sparing of the King's friends, he should not suffer his deputy wardens to enter Scotland; but, upon knowledge from Sadleyr or Anguisshe what towns and surnames belong to their friends, depute conductors of the raids; and he may send part of his garrisons with them, foreseeing that they go strong. Darnton, 31 Aug. Signed. P.S.Such as he knows to be the Governor's enemies he may keep waking, according to Sadleyr's letters. P. 1. Fly-leaf with address lost. Add. MS. 32,651, f. 299 B.M. Hamilton Papers, No. 472. 104. Arran to Henry VIII. Sends bearer, the laird of Bronstoune, gentleman of his house, to declare the extremities in this country, and how he lately wrote for a prorogation of 14 or 20 days, but has yet no answer, albeit this day the peace expires. If he can stay this insurrection, all things appointed by the treaty shall be performed. Refers to bearer and the instructions given to him. Edinburgh, 31 Aug. Signed : James Governour. Broad sheet, p. 1. Add. Sealed. Endd. : Therle of Arren to the King's Majesty, ult. Aug. 1543. R.O. St. P., III. 482. 105. Henry VIII. to the Deputy And Council Of Ireland. Answers the articles the Deputy sent by his secretary Parkar, as follows :1. Money shall be sent as soon as possible. 2. Robt. St. Leiger is to have the custody of Dungarvon, provided he dwell there; and a book of the fees and profits which Ormond had is to be sent to the King. 3. Sir Osburn Ychingham is to have the custody of Ballatymore. 4. Hears that some of the Retinue are unruly for want of promptness of the law to punish them. Henceforth the Retinue shall be punished by martial law, not by ordinary process, 5. Sends a commission for sale of wards and letting of waste lands. 6. Has, at present, peace with the Scots; but he and the Emperor have jointly intimated war against the Frenchmen, and therefore all Frenchmen resorting thither must be treated as enemies. 7. The device for the conversion of Christes Church abbey to the maintenance of a standing Council and free school seems good. They must send a true extent of the revenues, and particular declaration how they would employ them. 8. Is content with the Deputy's suit to repair hither for two months in winter, and directs him to signify who is meet to supply his place. 9. Had given the benefice of Trymme to one of his Chapel, but, perceiving since that he had granted the Deputy the gift of all benefices there except bishoprics and deaneries, is content that one Agard, son of the Deputy's comptroller, shall enjoy it. Draft. Endd. 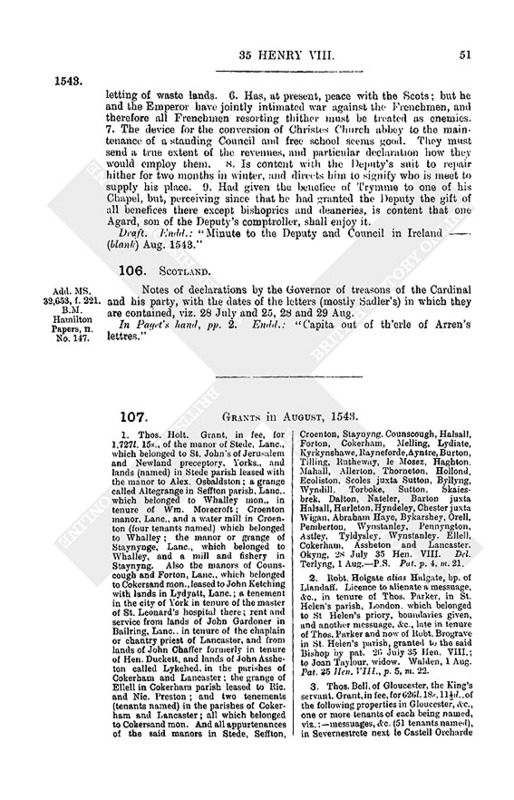 : "Minute to the Deputy and Council in Ireland (blank) Aug. 1543." Add. MS. 32,653, f. 221. B.M. Hamilton Papers, II. No. 147. Notes of declarations by the Governor of treasons of the Cardinal and his party, with the dates of the letters (mostly Sadler's) in which they are contained, viz. 28 July and 25, 28 and 29 Aug. In Paget's hand, pp. 2. Endd. : "Capita out of th'erle of Arren's lettres." 107. 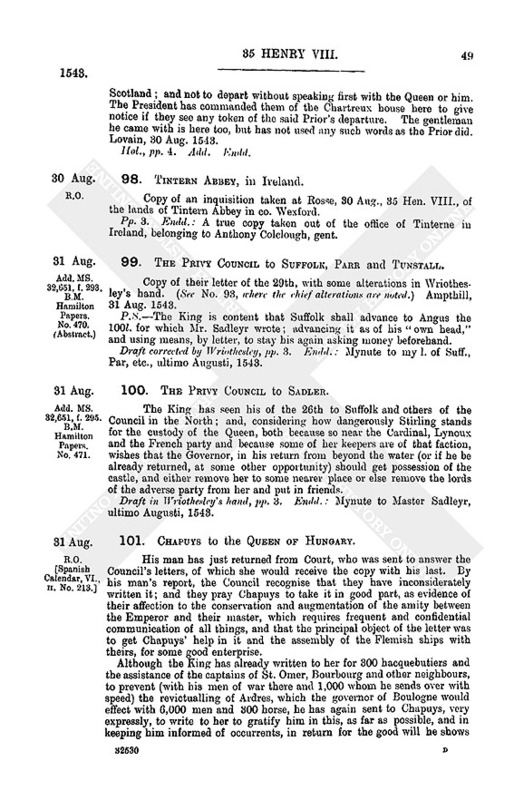 Grants in August, 1543. 1. Thos. Holt. Grant, in fee, for 1.727l. 15s., of the manor of Stede, Lanc., which belonged to St. John's of Jerusalem and Newland preceptory, Yorks., and lands (named) in Stede parish leased with the manor to Alex. Osbaldston; a grange called Altegrange in Seffton parish, Lanc., which belonged to Whalley mon., in tenure of Wm. Morecroft; Croenton manor, Lanc., and a water mill in Croenton (four tenants named) which belonged to Whalley; the manor or grange of Staynynge, Lanc., which belonged to Whalley, and a mill and fishery in Staynyng. Also the manors of Counscough and Forton, Lanc., which belonged to Cokersand mon., leased to John Ketching with lands in Lydyatt, Lanc. 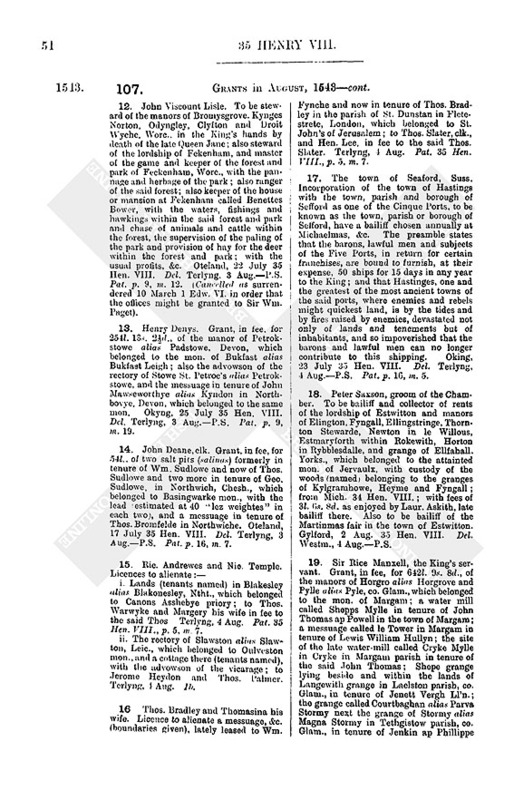 ; a tenement in the city of York in tenure of the master of St. Leonard's hospital there; rent and service from lands of John Gardoner in Bailring, Lanc., in tenure of the chaplain or chantry priest of Lancaster, and from lands of John Chaffer formerly in tenure of Hen. Duckett, and lands of John Assheton called Lykehed, in the parishes of Cokerham and Lancaster; the grange of Ellell in Cokerham parish leased to Ric. and Nic. Preston; and two tenements (tenants named) in the parishes of Cokerham and Lancaster; all which belonged to Cokersand mon. And all appurtenances of the said manors in Stede, Seffton, Croenton, Staynyng, Counscough, Halsall, Forton, Cokerham, Melling, Lydiate, Kyrkynshawe, Rayneforde, Ayntre, Burton, Tilling, Rutheway, le Mosez, Haghton. Mahall, Allerton, Thorneton, Hollond, Ecoliston, Scoles juxta Sutton, Byllyng, Wyndill. Torboke, Sutton, Skaiesbrek, Dalton, Nateler, Barton juxta Halsall, Hurleton, Hyndeley, Chester juxta Wigan, Abraham Haye, Bykarshey, Orell, Pemberton, Wynstanley, Pennyngton, Astley, Tyldysley, Wynstanley. Ellell, Cokerham, Assheton and Lancaster. Okyng, 28 July 35 Hen. VIII. Del. Terlyng, 1 Aug.P.S. Pat. p. 4, m. 21. 2. Robt. Holgate alias Halgate, bp. of Llandaff. Licence to alienate a messuage, &c., in tenure of Thos. Parker, in St. Helen's parish, London, which belonged to St Helen's priory, boundaries given, and another messuage, &c., late in tenure of Thos. Parker and now of Robt. Brograve in St. Helen's parish, granted to the said Bishop by pat. 26 July 35 Hen. VIII. ; to Joan Taylour, widow. Walden, 1 Aug. Pat. 25 Hen. VIII., p. 5, m. 22. 3. Thos. Bell, of Gloucester, the King's servant. Grant, in fee, for 626l. 18s. 11d., of the following properties in Gloucester, &c., one or more tenants of each being named, viz. :messuages, &c. (51 tenants named), in Severnestrete next le Castell Orcharde in St. Edwin's parish, a curtilage in Smale Lane in the same parish, messuages, &c., (10 tenants named) in Southyatestrete in the same parish, a tenement in Southyate strete opposite le Pillerie in the parish of St. Mary de Crippa, a tenement in Oldsmythestrete in the same parish called le Scolehouse in tenure of David Johns, a cottage in the same street and parish, two tenements in Brodesmythstrete in Holy Trinity parish and a garden in the same parish, a great tenement in the same parish in tenure of John Wingfteld, four stables, &c., in the same parish, a tenement between the bridges of Gloucester, and three other tenements in the parish of St. Nicholas, cottages (4 tenants named) in Craftes Lane in Holy Trinity parish, the tenement of John Wingffeld in the shambles called le Bochery Row, in Holy Trinity parish, two tenements in the Mercery (in Marccria) in the same parish, a stable in Grace Lane in the parish of St. Mary de Graceland, a piece of ground near Ayleyate Strete in St. Michael's parish, a great tenement in tenure of John Barkeley outside the gate of the same street in St. Michael's parish, and five other gardens, &c., in the same parish, one being in Northyate strete; a garden between the North Gates of the city in the parish of St. John Baptist, gardens, &c., in St. Oswald's parish (6 tenants named), a stable in St. Aldate's parish, a messuage, &c., in the parishes of Hempstede and St. Michael within the City,a tenement and two stables in Grace Lane in the parish of St. Mary de Gracelande, a tenement in the South Strete in All Saints parish, another tenement in the same parish, a tenement in the parish of St. Mary de Gracelande, a shop near the High Cross in the parish of St. Michael within the City, a tenement in the Mercery in Holy Trinity parish, a croft called Hyde Croft outside the North Gate of the city in St. Oswald's parish, a tenement in St. John's parish, a tenement in the Mercery in the parishes of Holy Trinity and St. Oswald, a tenement in Newlande outside the North Gate in St. Oswald's parish, a tenement in Aylesyatestrete in the parish of St. Michael within the City, a shop in the parish of St. Mary de Gracelande, a shop beside the temple or church of All Saints in All Saints parish, two gardens in the parish of St. Mary de Crippa near Trewelane, a new tenement in the parish of St. John Baptist, two tenements united in the parish of St. Nicholas, a tenement in St. Michael's parish, shops in Severnestrete in St. Edwin's parish, a tenement in le Bochery in the parish of St. Mary de Gracelande, a tenement on the south side of the street between the Bridges in St. Michael's parish, the void ground on which St. Kynbury's chapel lately stood, with a cottage adjoining in St. Edwin's parish; all which premises belonged to Lanthony priory in co. city of Gloucester. Also all possessions of Lanthony within the said city except rents of assize and other free rents. Also a toft beside the tenement of the late prior of St. Oswald's, between Here Lane and the river called Wyner in the parish of St. John Baptist, and another toft in the same parish, which belonged to Cirencester mon. Also a free rent and service which belonged to Hayles mon. 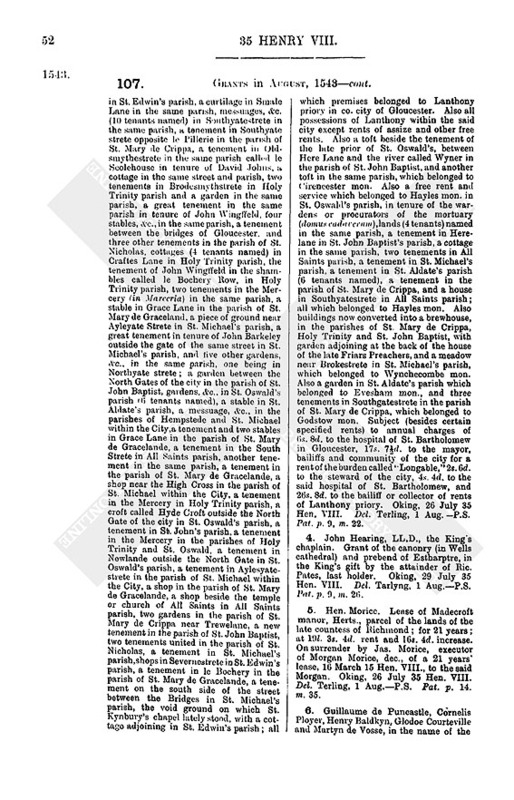 in St. Oswald's parish, in tenure of the wardens or procurators of the mortuary (domus cadavernm), lands (4 tenants) named in the same parish, a tenement in Herelane in St. John Baptist's parish, a cottage in the same parish, two tenements in All Saints parish, a tenement in St. Michael's parish, a tenement in St. Aldate's parish (6 tenants named), a tenement in the parish of St. Mary de Crippa, and a house in Southyatestrete in All Saints parish; all which belonged to Hayles mon. Also buildings now converted into a brewhouse, in the parishes of St. Mary de Crippa, Holy Trinity and St. John Baptist, with garden adjoining at the back of the house of the late Friars Preachers, and a meadow near Brokestrete in St. Michael's parish, which belonged to Wynchecombe mon. Also a garden in St. Aldate's parish which belonged to Evesham mon., and three tenements in Southgatestrete in the parish of St. Mary de Crippa, which belonged to Godstow mon. Subject (besides certain specified rents) to annual charges of 6s. 8d. to the hospital of St. Bartholomew in Gloucester, 17s. 7d. to the mayor, bailiffs and community of the city for a rent of the burden called "Longable," 2s. 6d. to the steward of the city, 4s. 4d. to the said hospital of St. Bartholomew, and 26s. 8d. to the bailiff or collector of rents of Lanthony priory. Oking, 26 July 35 Hen. VIII. Del. Terling, 1 Aug. P.S. Pat. p. 9, m. 22. 4. John Hearing, LL.D., the King's chaplain. Grant of the canonry (in Wells cathedral) and prebend of Estharptre, in the King's gift by the attainder of Ric. Pates, last holder. Oking, 29 July 35 Hen. VIII. Del. Tarlyng, 1 Aug.P.S. Pat. p. 9, m. 26. 5. Hen. Morice. Lease of Madecroft manor, Herts., parcel of the lands of the late countess of Richmond; for 21 years; at 19l. 3s. 4d. rent and 16s. 4d. increase. On surrender by Jas. Morice, executor of Morgan Morice, dec., of a 21 years' lease, 16 March 15 Hen. VIII., to the said Morgan. Oking, 26 July 35 Hen. VIII. Del. Terling, 1 Aug.P.S. Pat. p. 14. m. 35. 6. Guillaume de Puncastle, Cornelis Ployer, Henry Baldkyn, Glodoe Courteville and Martyn de Vosse, in the name of the bailiff, sheriffs, and officers of Dunkirke. Licence (at the contemplation of the Queen of Hungary, regent of the Emperor's Low Countries) to buy and convey to Dunkirk 500,000 billets. Oking, 30 July 35 Hen. VIII. Del. Terling, 1 Aug.P.S. In English. Enrolled on French Roll 36 Hen. VIII., m. 3. Rymer, XV. 49. 7. Joachim Gonelfynger, of Nurenbergh, the King's servant. Annuity of 50l. Oking, 30 July 35 Hen. VIII. Del. Terling, 2 Aug.P.S. Pat. p. 9, m. 19. 9. Thos. Hutton, of Driedrayton, Camb., and Anne his wife. Grant, in fee to the said Thos., for 546l. 10s. 4d., of the manor of Drydrayton alias Dryedrayton, Camb., which belonged to Barnewell priory; all lands in Dryedrayton now in tenure of John Wrotes, chaplain, and rent of 5s. for two closes or pightellis (boundaries given with regard to lands in Hutton's tenure, the tenement late of Coventre priory, and the highway, all which belonged to Barnewell. Also grant of the manor of Dryedrayton which belonged to Crowland mon , Linc., and the advowson of the parish church of Dryedrayton. Also grant of the advowsons of the parish churches of Harleton (of St. Mary) and Pap woor the Everard (of St Peter Apostle), Camb. The advowson of Harleton formerly belonged to the priory of Longueville in Normandy and Papwoorthe Everard is parcel of the duchy of Richmond. Oteland, 19 July 35 Hen. VIII. Del. Terlyng, 3 Aug.P.S. Pat. p. 1, m. 15. 10. Andrew Judde, alderman of London. Grant, in fee, for 669l. 11s. 4d., of the manor of Maisters in Preston, Suff., in tenure of John Spryng, which belonged to St. John's of Jerusalem and the preceptory of Batisford, Suff. ; the manor of Preston, Suff., and the rectory of Preston in tenure of Robt. Risse, and the advowson of Preston vicarage, which belonged to Holy Trinity priory, Ipswich; a close called le Olde Felde within Charewood forest in Charley parish, Leic., in tenure of Wm. Barnard, which belonged to the mon. of Pratis Leceister; and a water mill within the close called le Dames in Oulescroft, Leic., in tenure of Evan Todde, and numerous other lands (named, and tenants named) in Oulvescroft which belonged to Oulvescroft priory. Otelande, 18 July 35 Hen. VIII. Del Terlyng, 3 Aug.P.S. Pat. p. 3, m. 4. 11. Peter de Bydocyo, lord of Lartique, stranger, the King's servant. Annuity of 50l. Westm., 8 July 35 Hen. VIII. Del. Terling, 3 Aug.P.S. Pat. p. 5, m. 26. 12. John Viscount Lisle. To be steward of the manors of Bromysgrove. 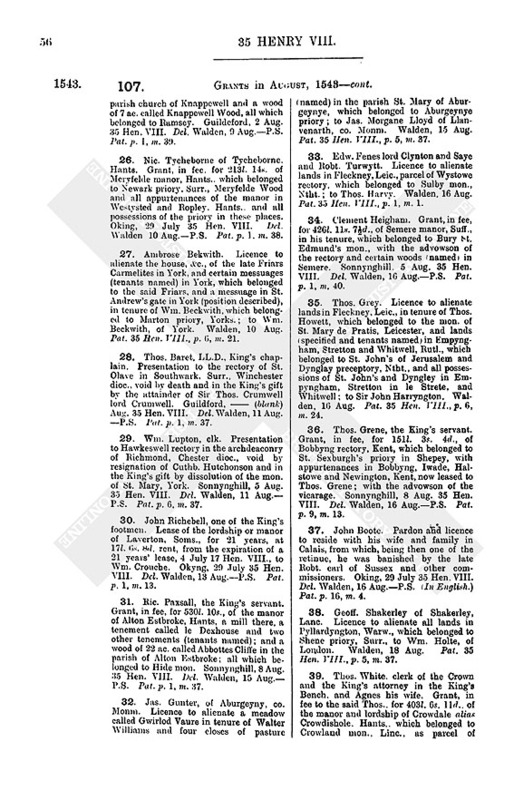 Kynges Norton, Odyngley, Clyfton and Droit Wychc, Worc., in the King's hands by death of the late Queen Jane; also steward of the lordship of Fekenham, and master of the game and keeper of the forest and park of Feckenham, Worc., with the pannage and herbage of the park; also ranger of the said forest; also keeper of the house or mansion at Fekenham called Benettes Bower, with the waters, fishings and hawkings within the said forest and park and chase of animals and cattle within the forest, the supervision of the paling of the park and provision of hay for the deer within the forest and park; with the usual profits, &c. Oteland, 22 July 35 Hen. VIII. Del. Terlyng, 3 Aug.P.S. Pat. p. 9, m. 12. (Caneclled as surrendered 10 March 1 Edw. VI. in order that the offices might be granted to Sir Wm. Paget). 13. Henry Denys. Grant, in fee, for 254l. 13s. 2d., of the manor of Petrokstowe alias Padstowe, Devon, which belonged to the mon. of Bukfast alias Bukfast Leigh; also the advowson of the rectory of Stowe St. Petroc's alias Petrokstowe, and the messuage in tenure of John Mawseworthye alias Kyndon in Northbovye, Devon, which belonged to the same mon. Okyng, 25 July 35 Hen. VIII. Del. Terlyng, 3 Aug.P.S. Pat. p. 9, m. 19. 14. John Deane, clk. Grant, in fee, for 54l., of two salt pits (salinas) formerly in tenure of Wm. Sudlowe and now of Thos. Sudlowe and two more in tenure of Geo. Sudlowe, in Northwich, Chesh., which belonged to Basingwarke mon., with the lead (estimated at 40 "lez weightes" in each two), and a messuage in tenure of Thos. Bromfelde in Northwiche. Oteland, 17 July 35 Hen. VIII. Del. Terlyng, 3 Aug.P.S. Pat. p. 16, m. 7.
i. Lands (tenants named) in Blakesley alias Blakonesley, Ntht., which belonged to Canons Asshebye priory; to Thos. Warwyke and Margery his wife in fee to the said Thos Terlyng, 4 Aug. Pat. 35 Hen. VIII., p. 5, m. 7.
ii. The rectory of Slawston alias Slawton, Leic., which belonged to Oulveston mon., and a cottage there (tenants named), with the advowson of the vicarage; to Jerome Heydon and Thos. Palmer. Terlyng, 4 Aug. Ib. 16. Thos. Bradley and Thomasina his wife. Licence to alienate a messuage, &c. (boundaries given), lately leased to Wm. Fynche and now in tenure of Thos. Bradley in the parish of St. Dunstan in Fletestrete, London, which belonged to St. John's of Jerusalem; to Thos. Slater, clk., and Hen. Lee, in fee to the said Thos. Slater. Terlyng, 4 Aug. Pat. 35 Hen. VIII., p. 5, m. 7. 17. The town of Seaford, Suss. 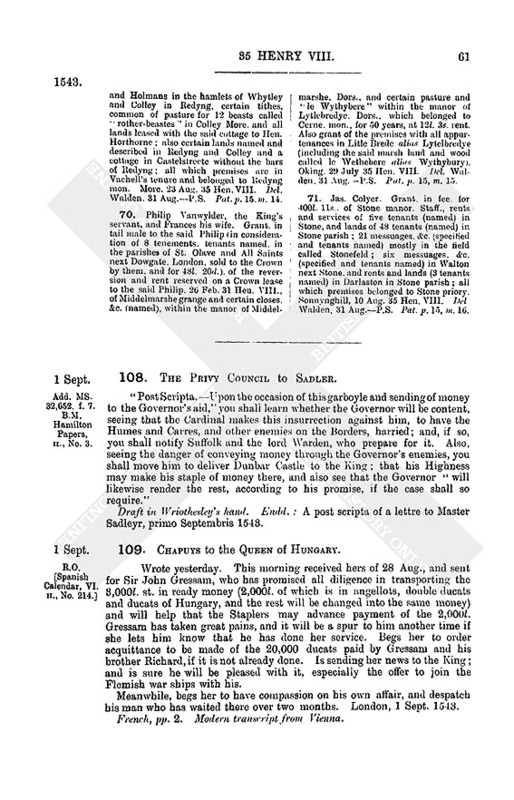 Incorporation of the town of Hastings with the town, parish and borough of Sefford as one of the Cinque Ports, to be known as the town, parish or borough of Selford, have a bailiff chosen annually at Michaelmas, &c. The preamble states that the barons, lawful men and subjects of the Five Ports, in return for certain franchises, are bound to furnish, at their expense, 50 ships for 15 days in any year to the King; and that Hastinges, one and the greatest of the most ancient towns of the said ports, where enemies and rebels might quickest land, is by the tides and by fires raised by enemies, devastated not only of lands and tenements but of inhabitants, and so impoverished that the barons and lawful men can no longer contribute to this shipping. Oking, 23 July 35 Hen. VIII. Del. Terlyng, 4 Aug.P.S. Pat. p. 16, m. 5. 18. Peter Saxson, groom of the Chamber. To be bailiff and collector of rents of the lordship of Estwitton and manors of Elington, Fyngall, Ellingstringe, Thornton Stewarde, Newton in le Willous, Estmaryforth within Rokewith, Horton in Rybblesdalle, and grange of Ellfahall. Yorks., which belonged to the attainted mon. of Jervaulx, with custody of the woods (named) belonging to the granges of Kylgramhowe, Heyme and Fyngall; from Mich. 34 Hen. VIII. ; with fees of 3l. 6s. 8d. as enjoyed by Laur. Askith, late bailiff there. Also to be bailiff of the Martinmas fair in the town of Estwitton. Gylford, 2 Aug. 35 Hen. VIII. Del. Westm., 4 Aug.P.S. 19. Sir Rice Manxell, the King's servant. Grant, in fee, for 642l. 9s. 8d., of the manors of Horgro alias Horgrove and Pylle alias Pyle, co. Glam., which belonged to the mon. of Margam; a water mill called Shepps Mylle in tenure of John Thomas ap Powell in the town of Margam; a messuage called le Tower in Margam in tenure of Lewis William Hullyn; the site of the late water-mill called Cryke Mylle in Cryke in Margam parish in tenure of the said John Thomas; Shepe grange lying beside and within the lands of Langewith grange in Laelston parish, co. Glam., in tenure of Jenett Vergh Ll'n. ; the grange called Courtbaghan alias Parva Stormy next the grange of Stormy alias Magna Stormy in Tethgistow parish, co. Glam., in tenure of Jenkin ap Phillippe and David ap Powell Goughe; and lands called Cadogan Landes in Horgro alias Horgrove in Tethgystowe parish; all which premises belonged to the said monastery of Margam; and all possessions of that mon. in Margam, both within and without the monastery walls, and in Brodemede, Brombille, Egloese Nunney, Cryke and Pentre in Margam parish and in the parishes of Marcrosse and Pylle, co. Glam. Also certain woods specified in Cryke, Margam, Horgrove and Pylle. The value of the premises exceeds the price paid by 100l., which is hereby released. Advowsons excepted. Hampton Court, 12 July, 35 Hen. VIII. Del. Terlyng, 5 Aug.P.S. 20. Ric. Parker, of Tawstok, Devon. Grant, in fee, for 1,436l. 7s. 10d., of the reversion and rent reserved on a Crown lease to Wm. Porteman, 15 July 28 Hen. VIII., of Bradford and Hilfaraunce rectories, Soms., which belonged to Barlyche priory, for 21 years at 18l. 4s. 6d. rent. Also grant of the said rectories; the advowson of Bradford vicarage; the lordship and manor of Pixton, Soms., which belonged to Taunton priory; the lordship and manor of Lynkcombe alias Lyncombe, Devon, which belonged to Dunkeswell mon. ; the lordship and manor of Wykelangforde Devon, which belonged to Frythelstok priory, and the lordship and manor of Moremaleherb, Devon, which belonged to Mynchynbuklande mon., Soms. ; with all appurtenances of the said lordships and manors in Pixton and Nynehed, Soms., and in Lynkcombe, Hilfarcombe, Wykelangforde, Moremalherbe, and Bardewodewiger, Devon. Also the rectory and advowson of the vicarage of Northemolton, Devon, which belonged to Lylleshull mon., Salop. Except advowsons other than above mentioned. Subject to certain charges. Gulforde, 2 Aug. 35 Hen. VIII. Del. Rayne, 6 Aug.P.S. (slightly mutilated). Pat. p. 5, m. 26. 21. Hen. Denys. Licence to alienate a messuage, &c., in tenure of John Nawscworthie alias Kyndon, in Northebovye parish, Devon, which belonged to Bukfast mon. ; to John Sowthcote. Terlyng, 6 Aug. Pat. 35 Hen. VIII., p 6, m. 20. 22. Sir Rice Manxell. Licence to alienate the site, &c., of Margam mon., co. Glam., granges called the Upper Graunge, Newgraunge, Southowse, Negecourt Graunge, and Whitecrosse Graunge, with the fishery in the water of Avon, in the parishes of Margam and Langonoyd, co. Glam., the grange called Saynt Mighellys Graunge, in the parishes of Kenfegg and Margam, and all his lands in the parishes of Margam and Langonoyd which are held of the King in capite; to Sir Edw. Carne, John Scudamour, Edw. Lewys, John Bassett of London, Jas. Thomas, Hugh Manxell brother of Sir Rice, and Reginald ap Hoell, to the use of the said Sir Rice and Cecilia his wife, and after their decease to the use of Edw. Manxell. one of the sons of the said Sir Rice and the heirs male of his body, and, in default, to the use of Ant. Manxell, another son of the said Sir Rice, and the heirs male of his body. The above estate in remainder to Ant. Manxell to be annulled whenever Philip Manxell. son and heir apparent of of the said Sir Rice, or his heirs, shall grant to the said Anthony and the heirs male of his body the whole grange of Langwyte and tithe of Penvey. co. Glam., without encumbrance; and then the use of the premises, in default of heirs male of the said Edw. Manxell. shall remain to the said Philip Manxell and the heirs male of his body, and in default to the use of the said Anthony and the heirs male of his body, and in default to the right heirs of the said Sir Rice. Terlyng, 6 Aug. Pat. 35 Hen. VIII., p. 6, m. 26. 23. Thos. Barnardiston, the King's servant. Grant, in fee, for 746l. 3s. 10d., of the manor of Dollowe, Beds., which belonged to St. Albans mon., the wood of 10 ac. called Rowme Wood in Luton, Beds., rent and service of John Akworthe for lands in Biscotte, Beds., and all appurtenances of the said manor in Luton parish; also the manor of Wrattyng alias Moche Wrattyng, Suff., woods called Alburnshey Coppice alias Aldershey Coppice, 80 ac. 1 ro., Thryllowe Coppice alias Thurlowe Coppice, 16 ac. 8 ro., and three smaller woods (named) in Wrattyng, Thurlow and Wethersfeld, Suff., and all appurtenances of the manor in Magna Wrattyng, Parva Wrattyng, Wrattyng Talworth, Thurlow and Wethersfeld, Suff. 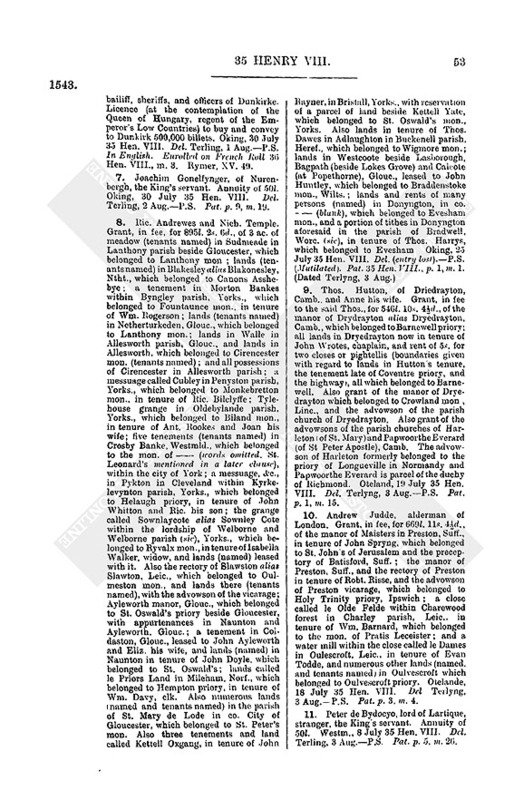 ; also the advowson of the rectory of Magna Wrattyng; which premises in Wrattyng, &c., belonged to the late Queen Jane. Also grant of the moiety of Haverynges manor, Beds., which belonged to Ric. Fermour, convicted of transgressions and contempts against the King, and seven woods (names and extents given) in Luton parish which belonged to Fermour, and all appurtenances of the said moiety in Haverynges and Luton. Oking, 25 July 35 Hen. VIII. Del. Walden, 8 Aug.P.S. Pat. p. 1, m. 20. 24. John Dixson, elk., late of Wakefield, Yorks., and Wm. Bromehed. of Myddelton, Yorks. Pardon of all treasons and misprisions of treasons committed before the date of this. Oking. 29 July 35 Hen. VIII. Del. Walden, 8 Aug. P. S. Pat. p. 9, m. 12. 25. Wm. Cooke, of Chesterton, Camb. Grant, in fee, for 380l. 17s. 9d., of Knappewell manor, Camb., which belonged to Ramsey mon. with the advowson of the parish church of Knappewell and a wood of 7 ac. called Knappewell Wood, all which belonged to Ramsey. Guildeford, 2 Aug. 35 Hen. VIII. Del. Walden, 9 Aug.P.S. Pat. p. 1, m. 39. 26. Nic. Tycheborne of Tycheborne. Hants. Grant, in fee. for 213l. 14s. of Meryfelde manor, Hants., which belonged to Newark priory. Surr., Meryfelde Wood and all appurtenances of the manor in Westysted and Ropley. Hants., and all possessions of the priory in these places. Oking, 29 July 35 Hen. VIII. Del. Walden 10 Aug.P.S. Pat. p. 1. m. 38. 27. Ambrose Bekwith. Licence to alienate the house, &c., of the late Friars Carmelites in York, and certain messuages (tenants named) in York, which belonged to the said Friars, and a messuage in St. Andrew's gate in York (position described), in tenure of Wm. Beckwith, which belonged to Marton priory, Yorks. ; to Wm. Beckwith, of York. Walden, 10 Aug. Pat. 35 Hen. VIII., p. 6, m. 21. 28. Thos. Baret, LL.D., King's chaplain. Presentation to the rectory of St. Olave in Southwark, Surr., Winchester dioc., void by death and in the King's gift by the attainder of Sir Thos. Crumwell lord Crumwell. Guildford, (blank) Aug. 35 Hen. VIII. Del. Walden, 11 Aug. P.S. Pat. p. 1, m. 37. 29. Wm. Lupton, clk. Presentation to Hawkeswell rectory in the archdeaconry of Richmond, Chester dioc., void by resignation of Cuthb. Hutchonson and in the King's gift by dissolution of the mon. of St. Mary, York. Sonnynghill, 5 Aug. 35 Hen. VIII. Del. Walden, 11 Aug. P.S. Pat. p. 6, m. 37. 30. John Richebell, one of the King's footmen. Lease of the lordship or manor of Laverton, Soms., for 21 years, at 17l. 6s. 8d. rent, from the expiration of a 21 years' lease, 4 July 17 Hen. VIII., to Wm. Crouche. Okyng, 29 July 35 Hen. VIII. Del. Walden, 13 Aug.P.S. Pat. p. 1, m. 13. 31. Ric. Paxsall, the King's servant. Grant, in fee, for 530l. 10s., of the manor of Alton Estbroke, Hants, a mill there, a tenement called le Dexhouse and two other tenements (tenants named); and a wood of 22 ac. called Abbottes Cliffe in the parish of Alton Estbroke; all which belonged to Hide mon. Sonnynghill, 8 Aug. 35 Hen. VIII. Del. Walden, 15 Aug. P.S. Pat. p. 1, m. 37. 32. Jas. Gunter, of Aburgeyny, co. Monm. Licence to alienate a meadow called Gwirlod Vaure in tenure of Walter Williams and four closes of pasture (named) in the parish St. Mary of Aburgeynye, which belonged to Aburgeynye priory; to Jas. Morgane Lloyd of Llanvenarth, co. Monm. Walden, 15 Aug. Pat. 35 Hen. VIII., p. 5, m. 37. 33. Edw. Fenes lord Clynton and Saye and Robt. Turwytt. Licence to alienate lands in Fleckney, Leic., parcel of Wystowe rectory, which belonged to Sulby mon., Ntht. ; to Thos. Harvy. Walden, 16 Aug. Pat. 35 Hen. VIII., p. 1, m. 1. 34. Clement Heigham. Grant, in fee, for 426l. 11s. 7d., of Semere manor, Suff., in his tenure, which belonged to Bury St. Edmund's mon., with the advowson of the rectory and certain woods (named) in Semere. Sonnynghill. 5 Aug. 35 Hen. VIII. Del. Walden, 16 Aug.P.S. Pat. p. 1, m. 40. 35. Thos. Grey. Licence to alienate lands in Fleckney, Leic., in tenure of Thos. Howett, which belonged to the mon. of St. Mary de Pratis, Leicester, and lands (specified and tenants named) in Empyngham, Stretton and Whitwell, Rutl., which belonged to St. John's of Jerusalem and Dynglay preceptory, Ntht., and all possessions of St. John's and Dyngley in Empyngham, Stretton in le Strete, and Whitwell; to Sir John Harryngton. Walden, 16 Aug. Pat. 35 Hen. VIII., p. 6, m 24. 36. Thos. Grene, the King's servant. Grant, in fee, for 151l. 3s. 4d., of Bobbyng rectory, Kent, which belonged to St. Sexburgh's priory in Shepey, with appurtenances in Bobbyng, Iwade, Halstowe and Newington, Kent, now leased to Thos. Grene; with the advowson of the vicarage. Sonnynghill, 8 Aug. 35 Hen. VIII. Del. Walden, 16 Aug.P.S. Pat. p. 9, m. 13. 37. John Boote. Pardon and licence to reside with his wife and family in Calais, from which, being then one of the retinue, he was banished by the late Robt. earl of Sussex and other commissioners. Oking, 29 July 35 Hen. VIII. Del. Walden, 16 Aug.P.S. (In English.) Pat. p. 16, m. 4. 38. Geoff. Shakerley of Shakerley, Lanc. Licence to alienate all lands in Pyllardyngton, Warw., which belonged to Shene priory, Surr., to Wm. Holte, of London. Walden, 18 Aug. Pat. 35 Hen. VIII., p. 5, m. 37. 39. Thos. White, clerk of the Crown and the King's attorney in the King's Bench. and Agnes his wife. Grant, in fee to the said Thos., for 403l. 6s. 11d., of the manor and lordship of Crowdale alias Crowdishole. Hants., which belonged to Crowland mon., Linc., as parcel of the cell of Fryeston; the manor of Anstye. Hants., which belonged to Battle abbey, Suss., and all appurtenances of these manors in Southwarborne and Alton, Hants. ; a pension of 4l. out of Southwarborne church, which belonged to Crowland mon., and all lands in tenure of the said Thos. White in Southwarborne which belonged to Crowland and Fryeston; the advowson of Southwarborne rectory and a wood of 3 ac. called Crowdale Grove in Southwarborne parish which belonged to Crowlande; and a wood of 10 ac. called Anstye Wood, in Alton parish. which belonged to Battle. Guildeford. 2 Aug. 35 Hen. VIII. Del. Walden. 18 Aug. P.S. Pat. p. 9, m. 5. 40. Wm. Eccliston. Grant, in fee, for 244l. 7s. 4d., of Singleton grange, in the parish of Kirkham, Lanc., which belonged to Cokersande mon., and lands (8 tenants named) in Kirkham parish, and (5 tenants named) in Midleigh in the said parish of Kirkham in Amoundernes, Lanc., all which belonged to Cokersande. Also a messuage. 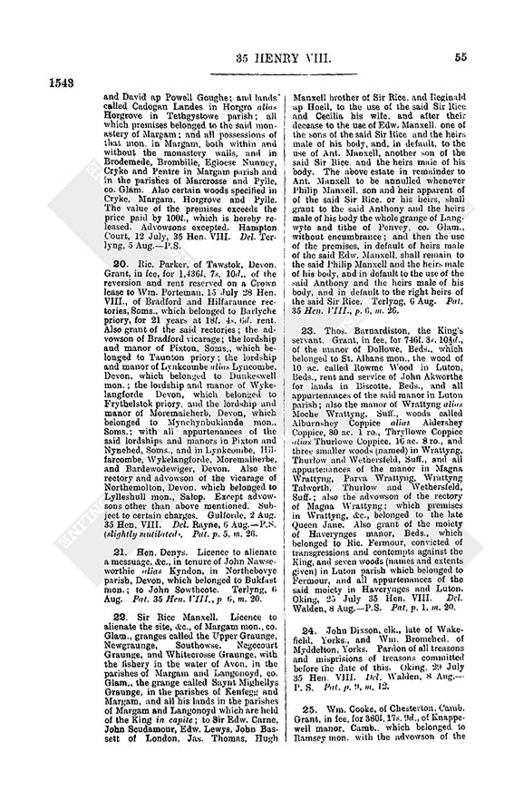 &c., in tenure of Barnard Smyth, which belonged to the late marquis of Exeter, attainted, lying outside the eastern gate of the town of Tottun, Devon, abutting on the tenement of St. Mary's church on the east, John Bidlake's tenement on the west, the High Street on the north, and the garden of John Rider. keeper of the chapel of St. Edmund upon the bridge of Totton, on the south. Also the advowson of Norton rectory. Suff. Sonnynghill, 10 Aug. 35 Hen. VIII. Del. Walden. 20 Aug.P.S. Pat. p. 9, m. 11. 41. Ric. Love, Wm. Hogeson, Wm. Beverley, John Fostall and Chas. Wolman. Grant of the office of maker of the King's gunpowder, with 6d. a day each. Okyng, 29 July 35 Hen. VIII. Del. Walden, 21 Aug.P.S. Pat. p. 16, m. 4. 42. Robert Cheyney and John Cheyney, his son. Grant. in fee. for 50l. 2s. 6d., of the land and wood of 110 ac. called the manor of Cheverey, lately leased to John Cheyney in Aston Clinton parish. Bucks., as parcel of the demesne lands of Aston Cheverey, Bucks., which belonged to Margaret countess of Sarum, attainted; also a virgate and a half of land containing 26 ac. of land and 6 ac. of wood upon the hill called Byttons next Bradneg in the same parish, which belonged to Aston Cheverey manor. Moore, 21 Aug. 35 Hen. VIII. Del. Walden, 24 Aug.P.S. Pat. p. 1, m. 35. 43. Sir Edw. Carne. Grant, in fee, for 453l. 18s. 1d., of Colwynston manor, co. Glam., which belonged to Dertford priory, Kent; and the house, &c., of the late Friars Preachers of Newporte, Monm., and a close of arable land in Newporte parish leased with the said house to Maurice Baker; except advowsons and leaden roofs of the Friars. Moore, 21 Aug. 35 Hen. VIII. Del. Walden, 24 Aug.P.S. Pat. p. 9, m. 4. 44. Thos. Knight, the King's servant. Grant, in fee, for 726l. 9s. 1d., of Hooe manor, Hants, which belonged to Southwyke mon., with three messuages called Roseys and Polense in Hooe, and all possessions of Southwyke mon. in Hooe. Also Tymmisburye manor, Hants, which belonged to St. Mary's mon., Winchester, with certain meadows, &c. (named, and tenants named) in Tymmisburye. Also Rothercombe manor, Hants, which belonged to Newarke mon., Surr. Also several woods (names and extents given) in Hooe, the forest of Berr, and Rothercombe, Hants. Moore, 21 Aug. 35 Hen. VIII. Del. Walden, 24 Aug.P.S. Pat. p. 9, m. 7. 45. Ric. Androys and Nic. Temple. Licence to alienate a messuage called Cubley in Penyston parish, Yorks., which belonged to Monkebretton mon., in tenure of Ric. Bylclyff; to Wm. Turton. Westm., 24 Aug. Pat. 35 Hen. 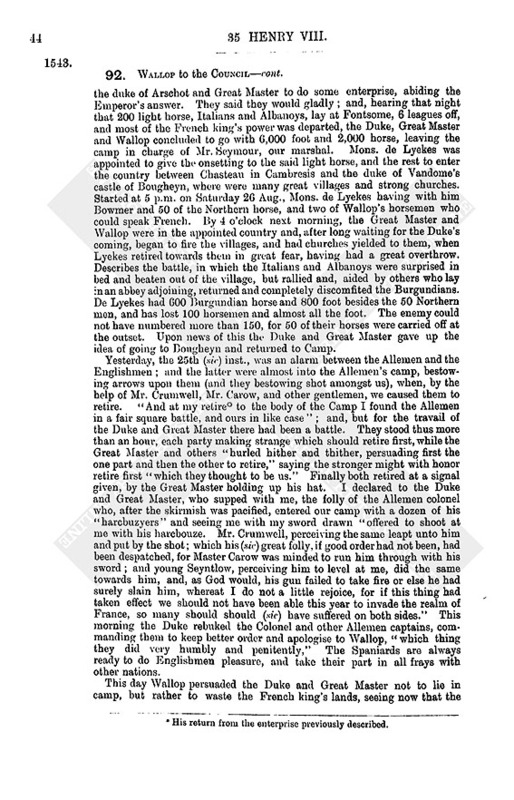 VIII., p. 13, m. 13.
i. Lands called le Priors Land in Myleham, Suff. (sic), which belonged to Hempton priory, in tenure of Wm. Davy, clk. ; to Thomas Grove. Westm., 25 Aug. Pat. 35 Hen. VIII., p. 6, m. 21.
ii. A messuage, &c., in Pikton in Cleveland within Kyrkelevyngton parish, Yorks., which belonged to Helaugh priory, in tenure of John Whytton and Ric. his son; to Wm. Gays, girdler, of London. Westm., 25 Aug. Ib. iii. The site and chief messuage of Turkedeane manor, Glouc., in tenure of Wm. Walter, which belonged to Lanthony priory, and lands (specified and tenants named) in Turkeden and Netherturkeden which also belonged to Lanthony; to Wm. Walter. Westm., 25 Aug. Ib. m. 33. 47. Wm. Sharyngton. Licence to alienate the lordships and manors of Culme St. Denis and Calcott alias Caldicott, Glouc., which belonged to Tewkesbury mon., and all possessions of Tewkesbury in Culne St. Denis and Calcot alias Caldicote in tenure of Hugh Westwood, John Peche and Eliz. Baggyer, widow; to Hugh Westwood. Westm., 25 Aug. Pat. 35 Hen. VIII., p. 6, m. 30. 48. Hen. Cruche, the King's servant. Grant, in fee, for 788l. 19s. 5d., of the site, &c., of Gresley priory. Derb., with all appurtenances in Gresley parish, viz., 3 mills, herbage of Bumley Wood and le Parke, and certain closes and lands (names and extents given which formed the demesne lands of the priory and are leased to Cruche. Also lands in Church Gresley and Castel Gresley, Derb., in tenure of Ralph Hethe and eight others named; Gresley rectory; a messuage called Messe Place in Hethcote, Derb, in tenure of Wm. Holmes and Alice his wife and Henry his son; lands in Donasthorpe (three tenants named), in Bowthorpe (four tenants), and in Swatlingcoote, Derb. (one tenant); and woods (extents given) called Bumley Wood, le Brache, Bumley Common, the Common Wood Abbeyparke Wood in Gresley parish; all which premises belonged to Gresley priory. Oking, 29 July 35 Hen. VIII. Del. Walden 25 AugP.S. Pat. p. 9, m. 13. 49. Thos. Knyght, one of the clerks of the Signet. Licence to alienate Rothercomb manor, Hants., which belonged to Newarke mon , Surr. ; to (blank) Vuedale. Walden, 25 Aug. Pat. 35 Hen. VIII., p. 12, m. 7. 51. Sir Geo. Cotton, the King's servant, and Mary his wife. Grant, in tail male to the said George, in consideration of his services, of Pulton manor, Chesh., the farm of Pulton in Pulforde parish, Chesh., and lands called Pulton in Pulton, Pulforde, Dodleston, Chirton and Chester, Chesh., and all appurtenances lying beyond the forest of La Mare and in the places above named, in tenure of Hen. Manley, also the chapel of Pulton; all which belonged to Delacres mon., Staff. Moore, 19 Aug. 35 Hen. VIII. Del. Walden, 26 Aug.P.S. Pat. p. 15, m. 18. 52. John Edmondes, of Dodyngton, Oxon. Grant, in fee, for 322l. 13s. 4d., of Clanfelde manor, Oxon, which belonged to Quenyngton preceptory, Glouc., and St. John's of Jerusalem, and all possessions of the preceptory in Clanfelde; also the rectory and the advowson of the vicarage of Clanfelde, which belonged to Elnestowe mon., Beds. ; subject to certain charges out of the rectory to Eton College and Alscote rectory. Moore, 23 Aug. 35 Hen. VIII. Del. Walden, 27 Aug.P.S. Pat. p. 1, m. 36. 53. Michael Fox, of London, grocer. Grant, in fee, for 571l. 3s. 9d., of the site, &c., of Chacombe priory, Ntht., and certain lands in Chacombe parish leased with the same to Sir Edm. Knightley; the lands (some specified) of a large number of tenants (named) in Chacombe parish; and the rectory and advowson of the vicarage of Chacombe; all which belonged to Chacombe priory. More, 23 Aug. 35 Hen. VIII. Del. Walden, 27 Aug.P.S. Pat. p. 9, m. 1. 54. Ant. Rous, the King's servant. To be comptroller of Calais, vice Sir Edw. Ryndgeley, with usual powers, and fees from 6 Oct. last, during pleasure; also, for support of him and clerks, an annuity of 80l. from 6 Oct. last, to be taken as well from the custom of 8d. a sack upon wool leaving the town as from the issues of the town, as Ryndgeley had it. Hampton Court. 12 July 35 Hen. VIII. Del. Walden, 28 Aug.P.S. Pat. p. 1, m. 31. 55. Hen. Cartwrighte. 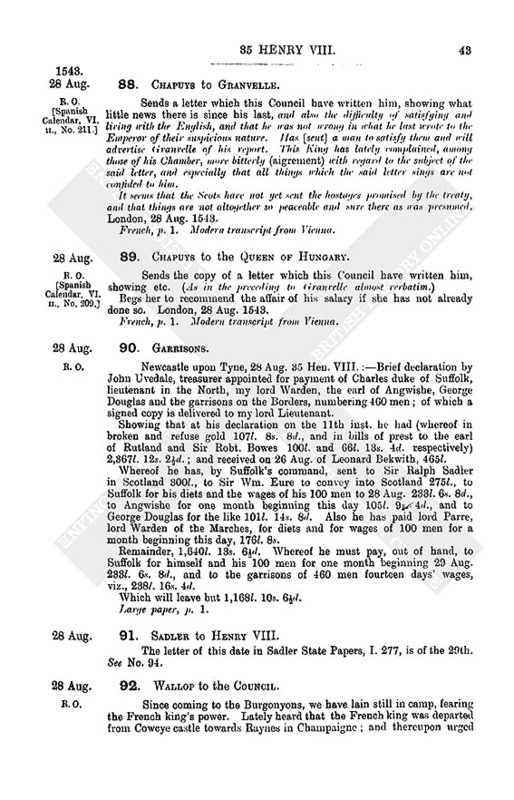 Grant, in fee (in consideration of the manors, lands, &c., in Rigmonde, Husbond Crawley and Fletewyke, Beds, Brickhill, Bucks, and Rode and Ashton, Ntht., sold to the Crown 20 June 35 Hen. VIII., and for 25l. 5s. 2d.) of Boycote manor, and a water mill in Boycote parish, Oxon, in tenure of Agnes ap Rice, widow, which belonged to Bitlesden mon. ; lands in Brickhill, Bucks, in tenure of John Harding which belonged to Dunstaple mon. ; the site and demesnes of Rotheley manor, Leic., in tenure of Humph. Babyngton, which belonged to St. John's of Jerusalem and to Dalby preceptory, Leic. ; the manor of Ayelton and Pixley, Herts (sic), which belonged to Minor Malverne priory; the site of the said manor of Ayelton and Pixley called Priours Court, in tenure of Hugh Taylour and Alice his wife and John their son. which belonged to Minor Malverne; Rugge rectory. Herts, which belonged to St. Alban's mon., in tenure of Robt. Longe, with the advowson of the vicarage; a messuage, &c., in the parishes of Sprotton and Credon alias Creton. Ntht., in tenure of Thos. Person alias Arthur, which belonged St. James's mon. next Northampton; the house of the late Friars Preachers of Atherston, Warw., and several messuages. &c. (tenants named) within the site of the same house in Atherston in the parish of Mauncester. Warw., with reservation to the inhabitants of Atherston of the church, &c., of the said Friars; and a wood called Tempelland Woode in Rotheley which belonged to St. John's of Jerusalem. Otelande. 21 July 35 Hen. VIII. Del. Walden, 28 Aug.P.S. Pat. p. 3, m. 6.
i. The house, &c., of the late Carmelite friars of Sele, Suss., to Owen Oglethorpe, clk., and Clement Oglethorpe, yeoman. Walden, 28 Aug. Pat. 35 Hen. VIII., p. 5. m. 24.
ii. A close called Warnes Leasue and lands in Colthrop in Standysshe parish. Glouc., in tenure of Alice Bonde. widow, parcel of Harsfelde manor, which belonged to Lanthony priory; to Wm. Bonde of Harsfelde. Walden, 28 Aug. Ib. m. 37.
iii. Lands (specified) in tenure of Robt. Perkyn. in Thurneby, Ntht., which belonged to Soulby mon. ; to Thos Pell, of Eltyngton, Ntht., and John. his son. Walden, 28 Aug. Pat. 35 Hen. VIII, p. 6. m. 20.
iv. Three messuages (tenants named) in Haresfelde. Glouc., parcel of Haresfelde manor, which belonged to Lanthony priory; to Wm. Watkyns and Thos. Organs. Walden. 28 Aug. Ib. v. Pasture and meadow called le More Heyes. parcel of Shipton manor, Soms. in the parish of Charletoune Mosgrave, in tenure of Steph. Andrewes, which belonged to Marg. countess of Sarum, attainted; to Ric. Dybbyn. Walden. 28 Aug. Ib. vi. Ayleworthe manor, Glouc., and lands (specified and tenants named) in Coldaston and Naunton. Glouc., which belonged to St. Oswald's priory; to John Stratford. sen. Westm. (sic), 28 Aug. Ib. m. 21.
vii. Lands in Quenton parish, Bucks, leased to Hen. Cowper, which belonged to Thame mon. ; to Chr. Cary. Walden, 28 Aug. Ib., m. 24.
viii. The farm of the site of Harsfelde manor and landa at Ryxbridge and Mortonsmeade and Harsfelde (tenants named) which belonged to Lanthony priory and are parcel of Harsfelde manor; to Thos. Rolle. Walden. 28 Aug. Ib., m. 25.
ix. Bradefeilde grange in Russhedon parish, Herts, which belonged to Wardon mon., Beds, in tenure of John Newporte; to John Newporte Walden 28 Aug. Ib. x. A messuage in Haylestrete and another in Colstrcte in Wynchecombe. Glouc. (tenants named), which belonged to Wynchelcombe mon. ; to Wm. Batell. Walden. 28 Aug. Ib. xi. A barn, &c., in Birporte Strete in Wynchecombe which belonged to Wynchelcombe mon., and a messuage in Haylestrete there which belonged to Tewkysbury mon., tenants named; to Hen. Hodgekyns alias Hogekyns. Walden. 28 Aug. Ib., m. 26.
xii. The site and chief messuage of Catebye manor, Leic., which belonged to Dunstaple priory. Beds, in tenure of Wm. Ball. and the rectory and advowson of the vicarage of Exton. Rutl., which belonged to St. Andrew's priory in Northampton; to Sir John Harryngton. Walden, 28 Aug. Ib. m. 27.
xiii Lands specified in tenure of Ric. Byrt in Haresfelde Glouc., parcel of Haresfelde manor, which belonged to Lanthony priory; to Walter Byrte. Walden, 28 Aug. Ib., m. 29.
xiv. Lands (specified and tenants named) which are parcel of the demesnes of Barton Abbatis manor, in the parish of St. Mary de Lode, Gloucester, which belonged to St. Peter's mon. ; to Giles Robertes, of (blank), Glouc. Walden, 28 Aug. Ib., m. 32. 57. Ric. Andrewes and Wm. Romsden. Licence to alienate lands (specified and tenants named) in Wakefeld, Yorks., which belonged to Monkebretton mon. ; to Ric., Pymond, merchant. Walden, 28 Aug. Pat. 35 Hen. VIII., p. 6, m. 34. 58. Ric. Fissher. Lease of Hadlowe manor, Kent, now in his tenure and lately in that of Thos. Somer, and pasture and pannage for 30 swine alias "lez hogges" in Northfrith park; for 21 years; at 11l. rent. Grenewiche, 25 June 35 Hen. VIII. Del. Walden, 29 Aug.P.S. Pat. 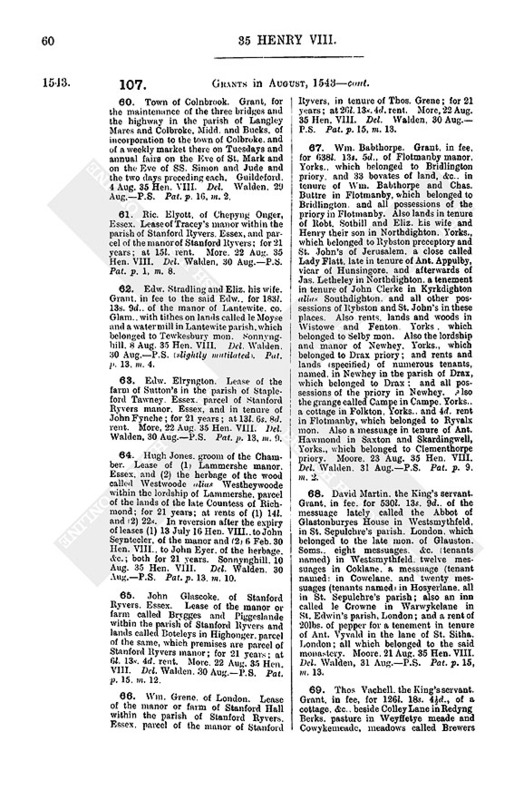 p. 1, m. 34.
i. Aishecliste manor, Devon, which belonged to Torre mon., with appurtenances in Plymtre, Payhembery and Brodclyff, Devon; to John Peter, jun., of Torre Bryn, Devon. (place blank) 29 Aug. Pat. 35 Hen. VIII., p. 6, m. 22.
ii. Aischecliste manor, Devon, the chief messuage called Assheclyste Ferme in Brodcclyste parish and all lands in Brodeclyst called "lez demayn landes" of the manor or Barton Landes leased with the said chief messuage, to Wm. Adam, and all appurtenances of the manor in Plymtre, Payhembery and Brodclyff, Devon, which premises belonged to Torre mon. ; to John Peter, jun., of Torre Bryan, Devon. Walden, 29 Aug, Ib., m. 34. 60. Town of Colnbrook. Grant, for the maintenance of the three bridges and the highway in the parish of Langley Marcs and Colbroke, Midd. and Bucks, of incorporation to the town of Colbroke, and of a weekly market there on Tuesdays and annual fairs on the Eve of St. Mark and on the Eve of SS. Simon and Jude and the two days preceding each. Guildeford. 4 Aug. 35 Hen. VIII. Del. Walden. 29 Aug.P.S. Pat. p. 16, m. 2. 61. Ric. Elyott, of Chepyng Onger, Essex. Lease of Tracey's manor within the parish of Stanford Ryvers. Essex, and parcel of the manor of Stanford Ryvers; for 21 years; at 15l. rent. More. 22 Aug. 35 Hen. VIII. Del. Walden, 30 Aug.P.S. Pat. p. 1, m. 8. 62. Edw. Stradling and Eliz. his wife. Grant, in fee to the said Edw., for 183l. 13s. 9d., of the manor of Lantewite. co. Glam., with tithes on lands called le Moyse and a water mill in Lantewite parish, which belonged to Tewkesbury mon. Sonnynghill, 8 Aug. 35 Hen. VIII. Del. Walden. 30 Aug.P.S. (slightly mutilated). Pat. p. 13, m. 4. 63. Edw. Elryngton. Lease of the farm of Sutton's in the parish of Stapleford Tawney. Essex, parcel of Stanford Ryvers manor. Essex, and in tenure of John Fynche; for 21 years; at 13l. 6s. 8d. rent. More, 22 Aug. 35 Hen. VIII. Del. Walden, 30 Aug.P.S. Pat. p. 13, m. 9. 64. Hugh Jones, groom of the Chamber. Lease of (1) Lammershe manor. Essex, and (2) the herbage of the wood called Westwoode alias Westheywoode within the lordship of Lammershe, parcel of the lands of the late Countess of Richmond; for 21 years; at rents of (1) 14l. and (2) 22s. In reversion after the expiry of leases (1) 13 July 16 Hen. VIII., to John Seyntecler, of the manor and (2) 6 Feb. 30 Hen. VIII., to John Eyer, of the herbage. &c.; both for 21 years. Sonnynghill. 10 Aug. 35 Hen. VIII. Del. Walden. 30 Aug.P.S. Pat. p. 13. m. 10. 65. John Glascoke. of Stanford Ryvers. Essex. Lease of the manor or farm called Brygges and Piggeslande within the parish of Stanford Ryvers and lands called Boteleys in Highonger, parcel of the same, which premises are parcel of Stanford Ryvers manor; for 21 years; at 6l. 13s. 4d. rent. More, 22 Aug. 35 Hen. VIII. Del. Walden. 30 Aug.P.S. Pat. p. 15. m. 12. 66. Wm. Grene. of London. Lease of the manor or farm of Stanford Hall within the parish of Stanford Ryvers. Essex. parcel of the manor of Stanford Ryvers, in tenure of Thos. Grene; for 21 years; at 26l. 13s. 4d. rent. More, 22 Aug. 35 Hen. VIII. Del. Walden, 30 Aug. P.S. Pat. p. 15, m. 13. 67. Wm. Babthorpe. Grant, in fee, for 638l. 13s. 5d., of Flotmanby manor, Yorks., which belonged to Bridlington priory. and 33 bovates of land, &c., in tenure of Wm. Babthorpe and Chas. Buttre in Flotmanby, which belonged to Bridlington, and all possessions of the priory in Flotmanby. Also lands in tenure of Robt. Sothill and Eliz. his wife and Henry their son in Northdighton. Yorks., which belonged to Rybston preceptory and St. John's of Jerusalem, a close called Lady Flatt, late in tenure of Ant. Appulby, vicar of Hunsingore. and afterwards of Jas. Letheley in Northdighton. a tenement in tenure of John Clerke in Kyrkdighton alias Southdighton. and all other possessions of Rybston and St. John's in these places. Also rents, lands and woods in Wistowe and Fenton. Yorks. which belonged to Selby mon. Also the lordship and manor of Newhey, Yorks., which belonged to Drax priory; and rents and lands (specified) of numerous tenants, named. in Newhey in the parish of Drax, which belonged to Drax; and all possessions of the priory in Newhey. Also the grange called Campe in Campe. Yorks., a cottage in Folkton, Yorks., and 4d. rent in Flotmanby, which belonged to Ryvalx mon. Also a messuage in tenure of Ant. Hawmond in Saxton and Skardingwell, Yorks., which belonged to Clementhorpe priory. Moore. 23 Aug. 35 Hen. VIII. Del. Walden. 31 Aug.P.S. Pat. p. 9. m. 2. 68. David Martin, the King's servant. Grant, in fee. for 530l. 13s. 9d., of the messuage lately called the Abbot of Glastonburyes House in Westsmythfeld. in St. Sepulchre's parish. London, which belonged to the late mon. of Glauston. Soms., eight messuages. &c. (tenants named) in Westsmythfeld. twelve messuages in Coklane. a messuage (tenant named : in Cowelane. 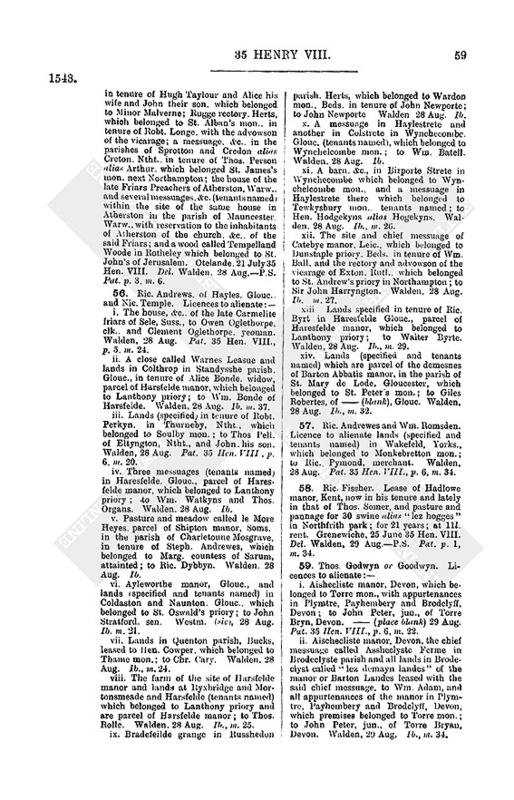 and twenty messuages (tenants named) in Hosyerlane. all in St. Sepulchre's parish; also an inn called le Crowne in Warwykelane in St. Edwin's parish, London; and a rent of 201bs. of pepper for a tenement in tenure of Ant. Vyvald in the lane of St. Sitha. London; all which belonged to the said monastery. Moore. 21 Aug. 35 Hen. VIII. Del. Walden, 31 Aug.P.S. Pat. p. 15, m. 13. 69. Thos Vachell. the King's servant. Grant, in fee, for 126l. 18s. 4d., of a cottage. &c., beside Colley Lane in Redyng Berks, pasture in Weyffetye meade and Cowykemeade, meadows called Brewers and Holmans in the hamlets of Whytley and Colley in Redyng, certain tithes, common of pasture for 12 beasts called "rother-beastes" in Colley More, and all lands leased with the said cottage to Hen. Horthorne; also certain lands named and described in Redyng and Colley and a cottage in Castelstreete without the bars of Redyng; all which premises are in Vachell's tenure and belonged to Redyng mon. More, 23 Aug. 35 Hen. VIII. Del. Walden. 31 Aug.P.S. Pat. p. 15. m. 14. 70. Philip Vanwylder, the King's servant, and Frances his wife. Grant, in tail male to the said Philip (in consideration of 8 tenements, tenants named, in the parishes of St. Olave and All Saints next Dowgate. London, sold to the Crown by them, and for 48l. 20d.). of the reversion and rent reserved on a Crown lease to the said Philip. 26 Feb. 31 Hen. VIII., of Middelmarshe grange and certain closes. &c. (named), within the manor of Middelmarshe, Dors., and certain pasture and "le Wythybere" within the manor of Lytlebredye, Dors., which belonged to Cerne. mon., for 50 years, at 12l. 3s. rent. Also grant of the premises with all appurtenances in Litle Bredc alias Lytelbredye (including the said marsh land and wood called le Wethebere alias Wythybury). Oking. 29 July 35 Hen. VIII. Del. Walden. 31 Aug. P.S. Pat. p. 15, m. 15. 71. Jas, Colyer, Grant, in fee, for 400l. 11s., of Stone manor. 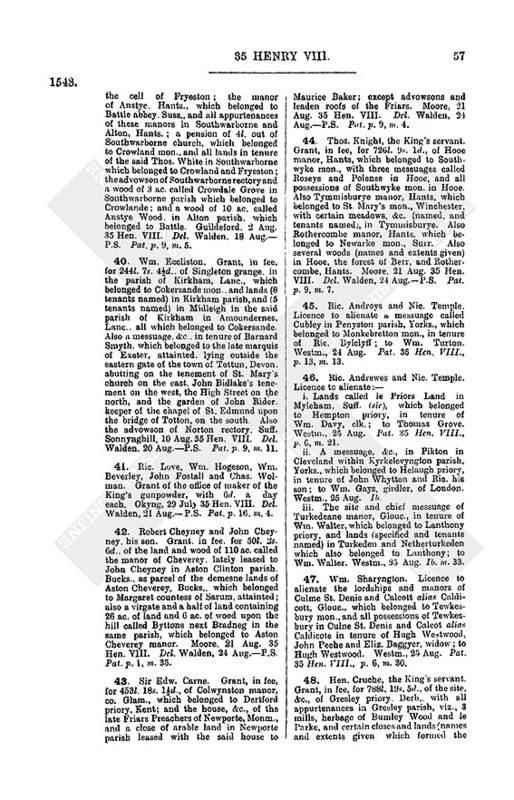 Staff., rents and services of five tenants (named) in Stone, and lands of 48 tenants (named) in Stone parish; 21 messuages, &c. (specified and tenants named) mostly in the field called Stonefeld; six messuages. &c. (specified and tenants named) in Walton next Stone, and rents and lands (3 tenants named) in Darlaston in Stone parish; all which premises belonged to Stone priory. Sonnynghill, 10 Aug. 35 Hen. VIII. Del Walden, 31 Aug.P.S. Pat. p. 15, m. 16. 2. Misprinted 24th in Sadler State Papers. 3. The Duke of Savoy. 4. His return from the enterprise previously described. 5. Of course No. 39, though that is dated the 13th in our transcripts. 7. Emanuel Philibert, son of Charles, duke of Savoy.